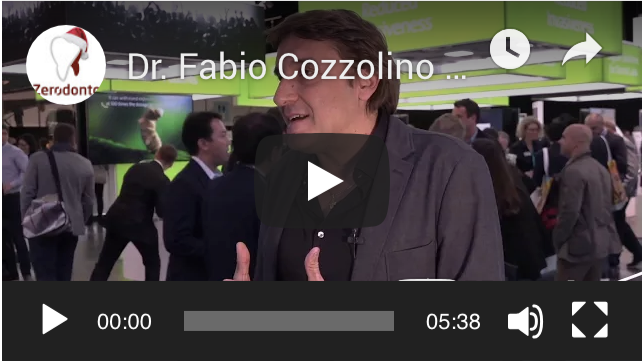 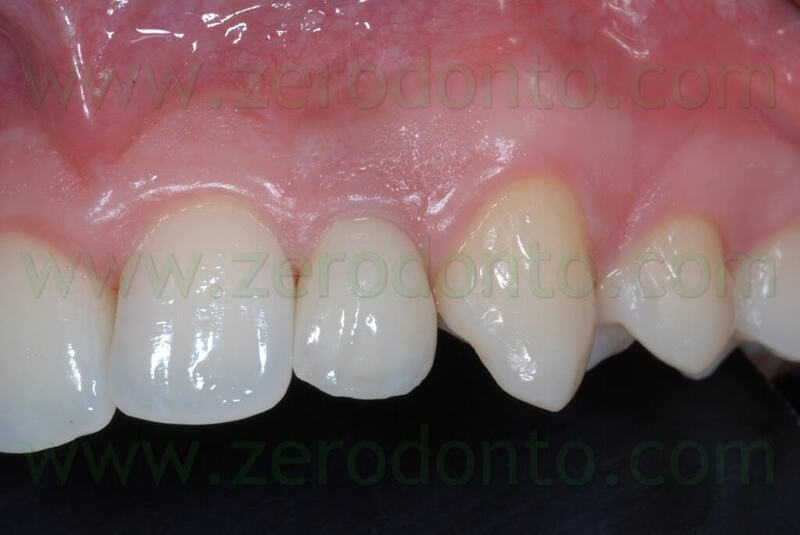 The surgical phase of a case of agenesis of two lateral incisors treated inserting two Straumann Bone Level SLActive implants (4.1 mm diameter, 10 mm long) has been dealt with in a previous article. 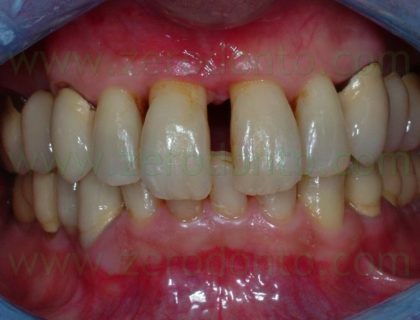 The patient PA, 23 year old male, suffering from bilateral agenesis of the maxillary lateral incisors, was thoroughly informed of the available therapeutic options for his prosthetic rehabilitation. 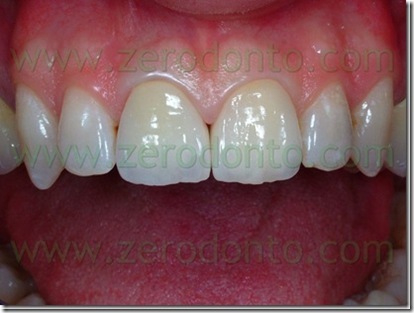 Before and after inserting the implants the patient underwent orthodontic therapy. 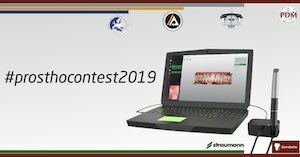 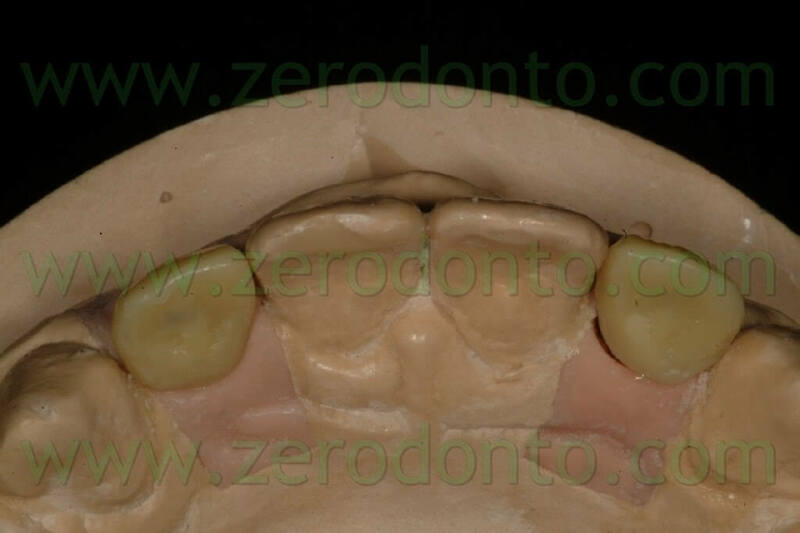 The patient had come to the chairside examination presenting a malocclusion characterized by a deep bite, a molar and canine first class on the right and a left molar first class while the left canines were in a cusp to cusp relationship, due to the mesialization of the 23. 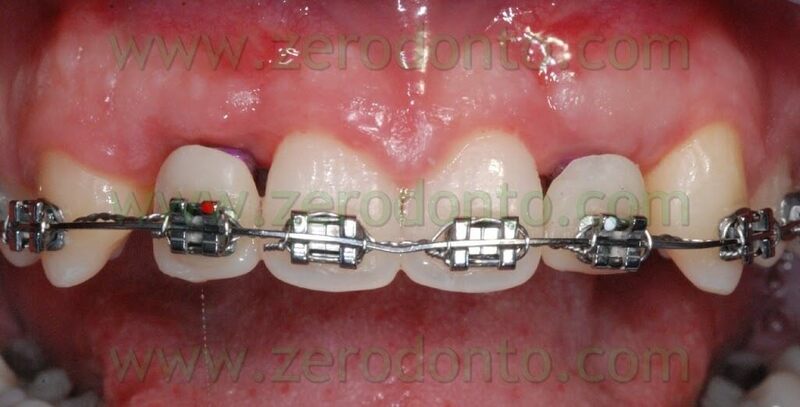 The aim of the orthodontic therapy was to solve the deep bite and to create the correct spaces to position the implants in region 12 and 22. 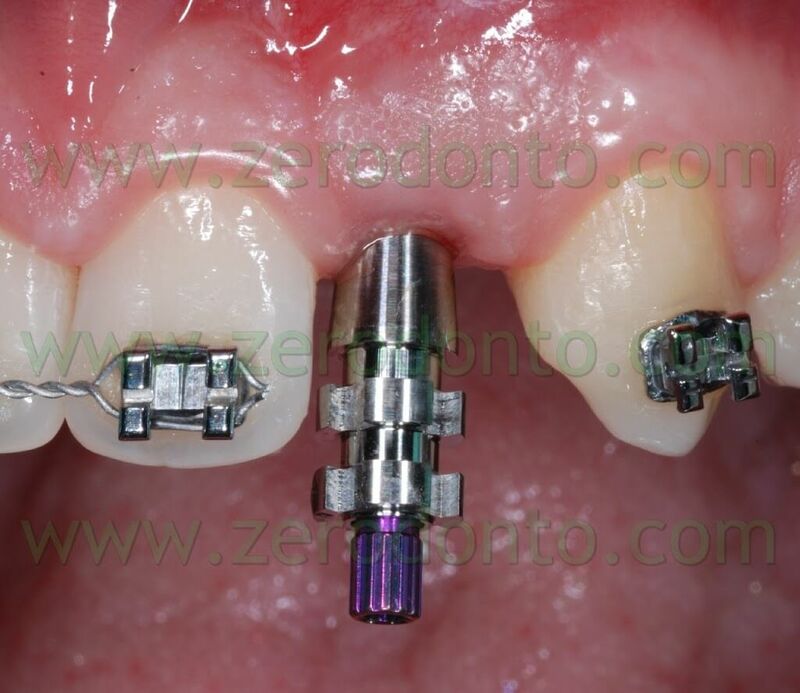 The situation at the beginning of the therapy was the following: the space for the 22 was almost correct but the 23 was mesialized and there was a diastema of about 3 mm between the 23 and the 24; the space for the 12 was excessive while the position of the canine was correct. 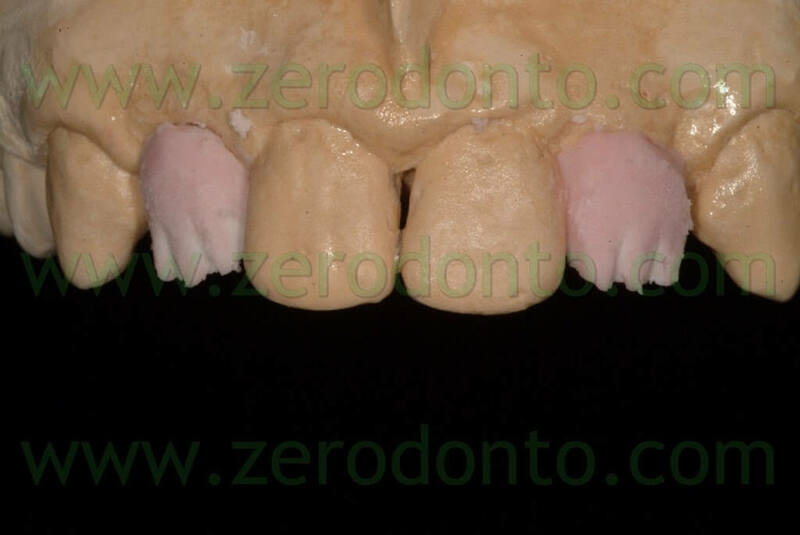 In order to normalize the spaces to insert the implants and finish the therapy with a right and left canine first class it was necessary to normalize the ratio between the dental dimensions of the anterior maxillary and mandibular groups either enlarging the maxillary central incisors, best option, or reducing the mesiodistal diameter of the anterior mandibular group. 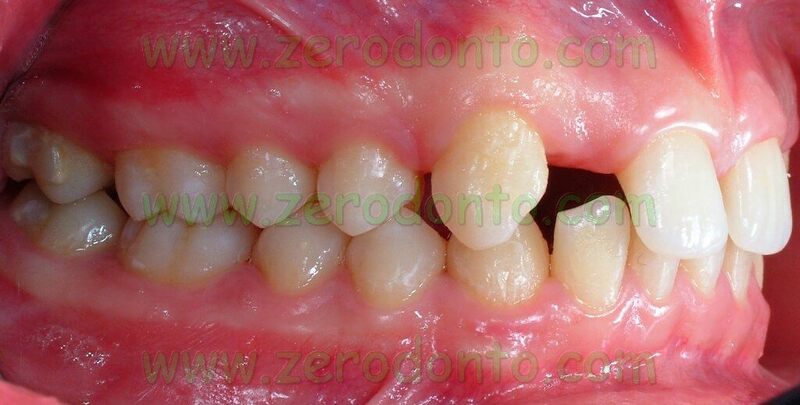 Otherwise the therapy would have resulted in a molar and canine cusp to cusp relationship. 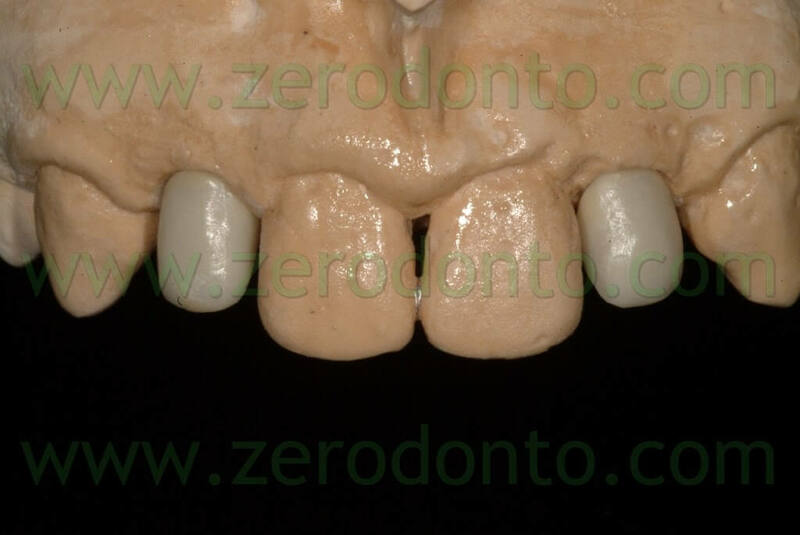 Unfortunately the patient wanted neither to enlarge his maxillary central incisors nor to reduce his mandibular anterior group and accepted a trade-off closure with a molar and canine cusp to cusp relationship. 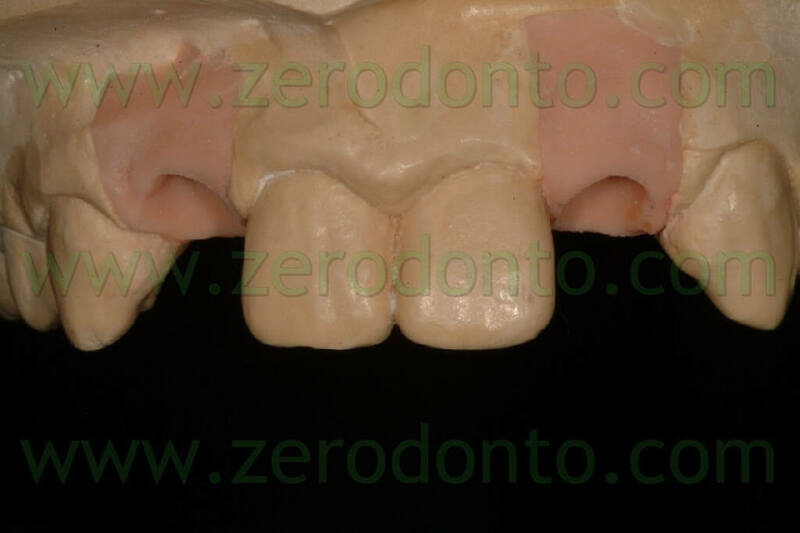 After aligning the arches and normalizing overjet and overbite the implants were positioned in an ideal position in respect to the maxillary central incisors, the midline and the previously made waxing. 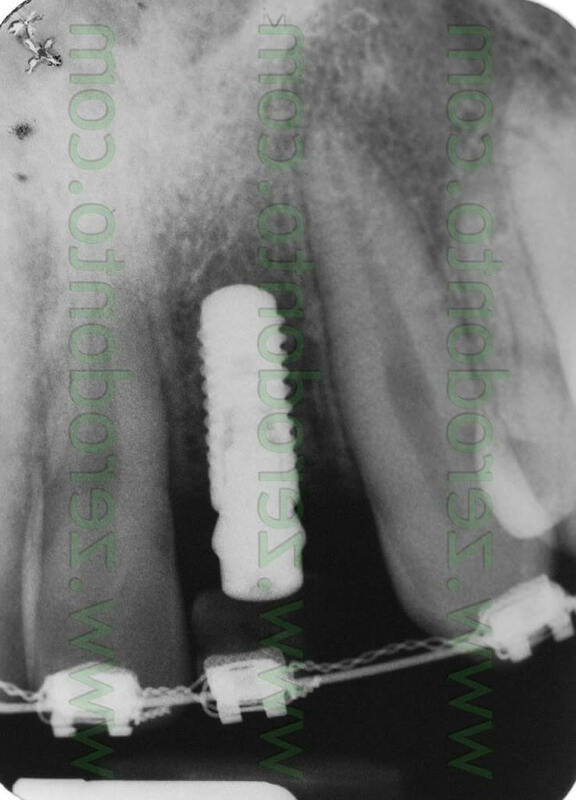 After loading the implants they were used as anchorage to mesialize the maxillary right and left lateral-posterior sectors. 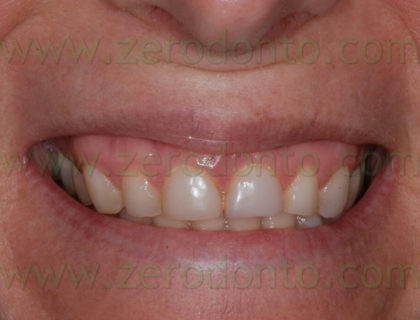 to rehabilitate the patient’s aesthetic function. 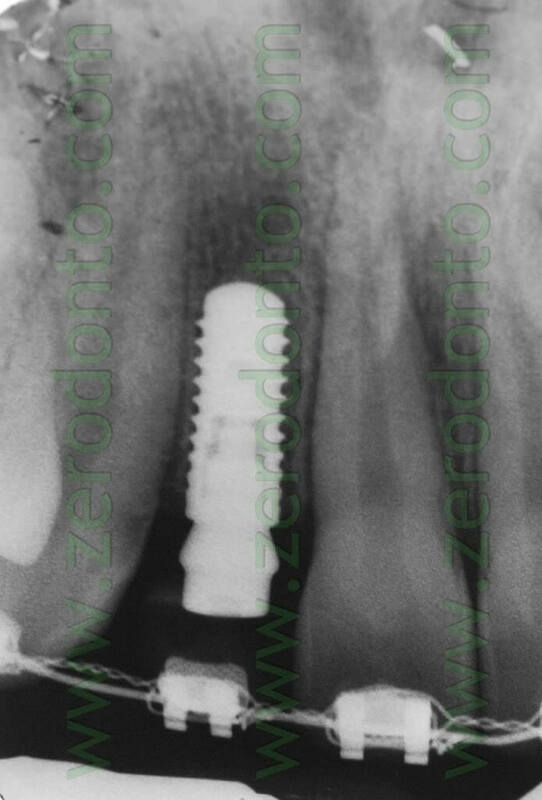 After checking the correct osseointegration of the implants both clinically and by means of X-rays, the real temporarization was carried out. 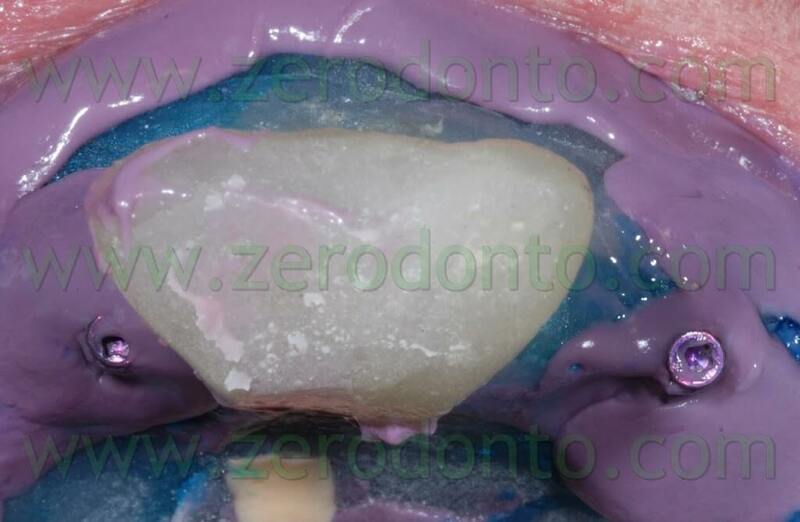 An irreversible hydrocolloid impression (i.e. 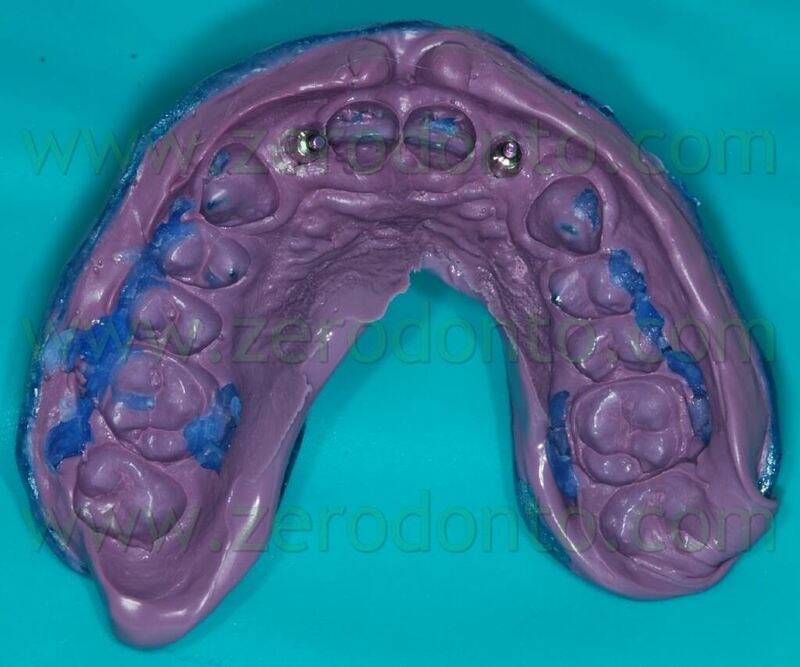 alginate) was taken in order to make a custom impression tray using self polymerizing resin. 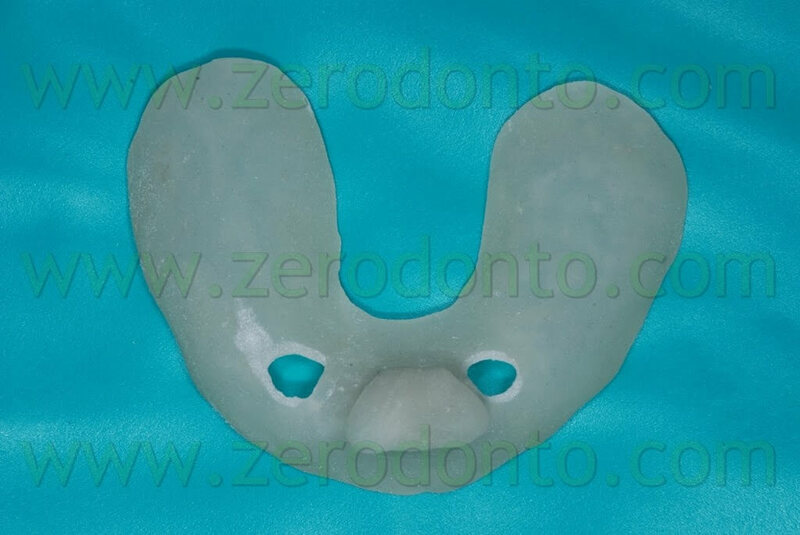 The impression tray must be made at least 24 hours before taking the precision impression, in order to avoid any possible interference between the contraction of the resin caused by the polymerization and the dimensional stability and accuracy of the reproduction of the details of the impression itself. 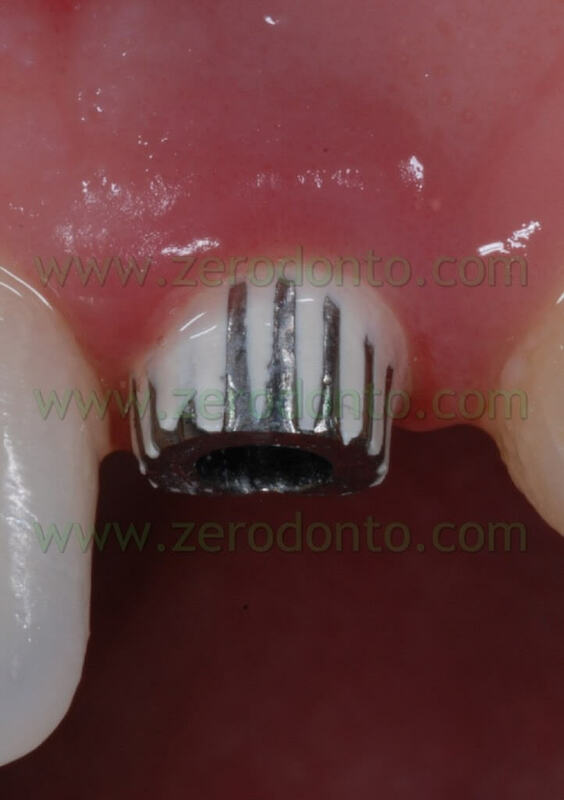 The custom impression tray was pierced by the implant supports in regions 12 and 22 to allow access to the impression transfer tightening screws. 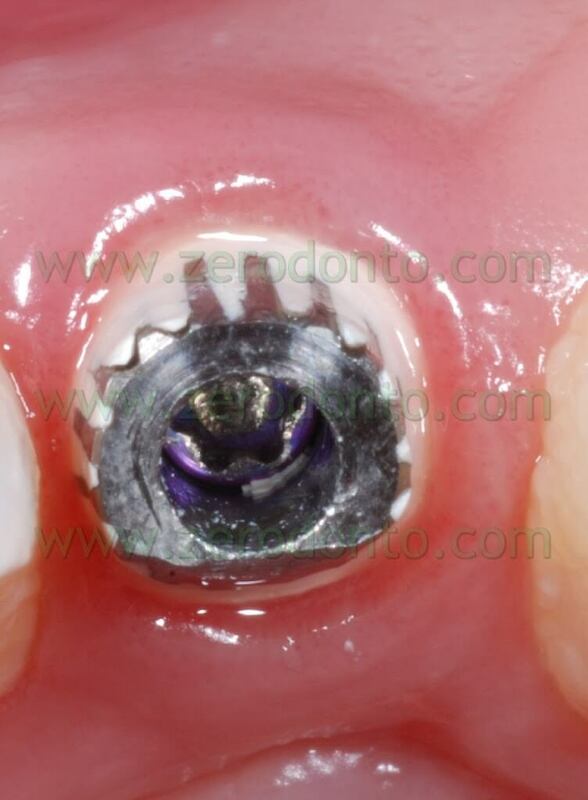 After removing the healing abutments, these transfers are screwed intraorally on their respective implants at 15 Ncm, using a dynamometric key. 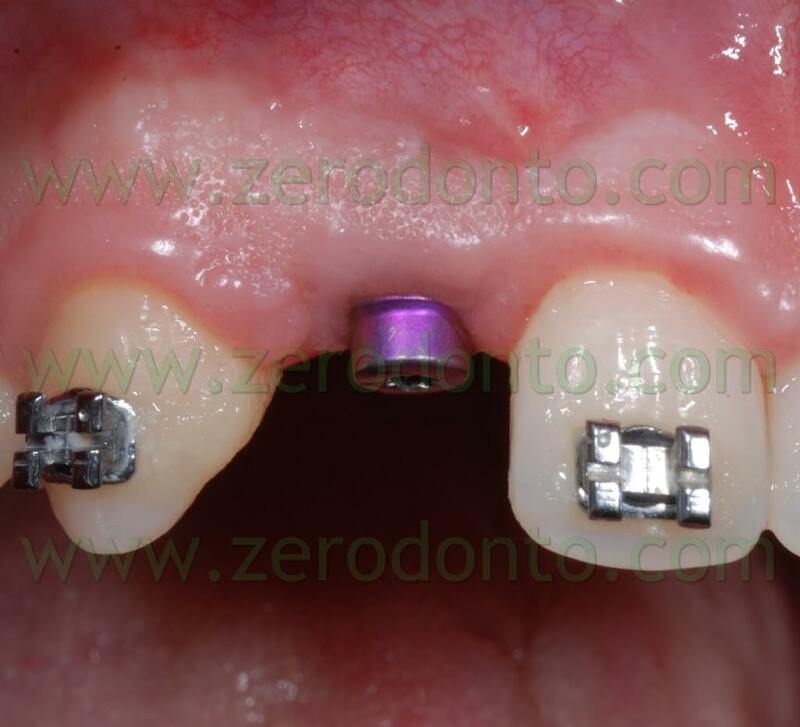 The correct accord of impression copings and neck implant was checked by means of X-rays. 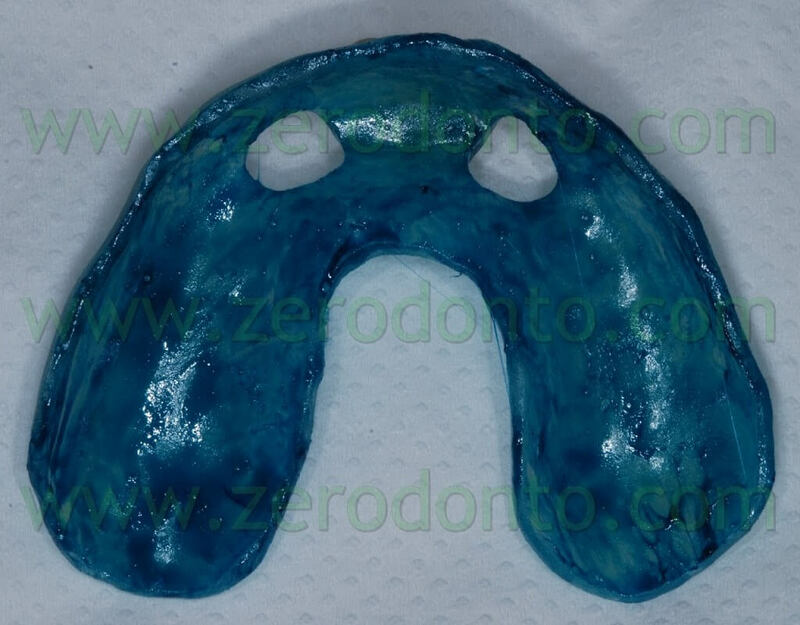 The undercuts created by the orthodontic brackets were blocked using soft wax, in order to make the removal of the impression tray from the mouth easier. 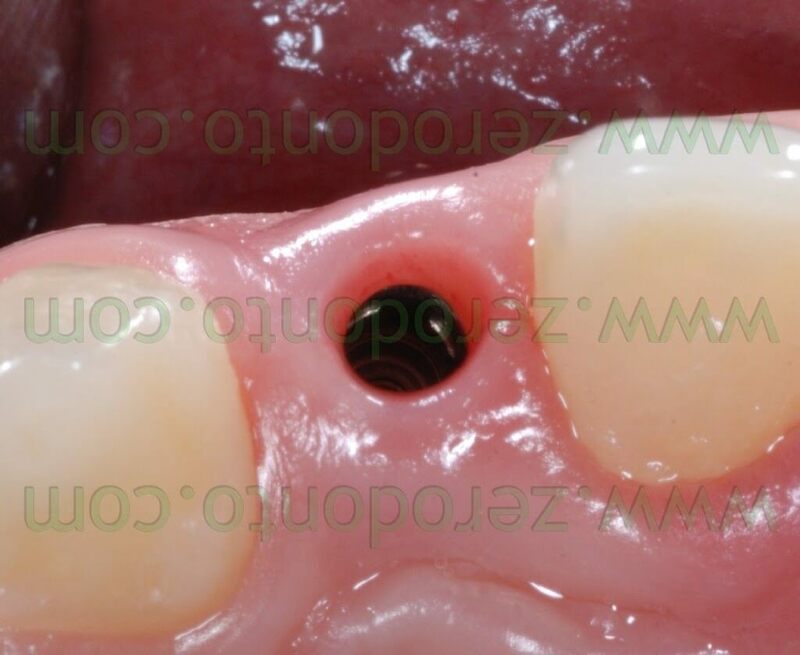 The impression tray was tested intraorally to verify the exact correspondence between the previously made holes and the impression copings. 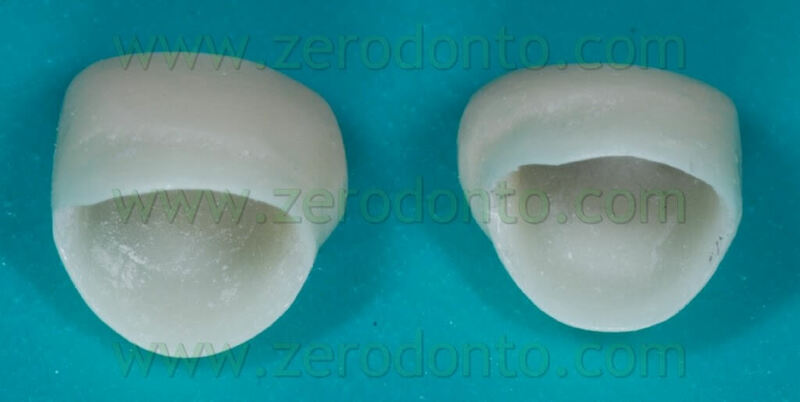 An adhesive for polyether was applied on the impression tray and a first impression with high viscosity polyether was taken. 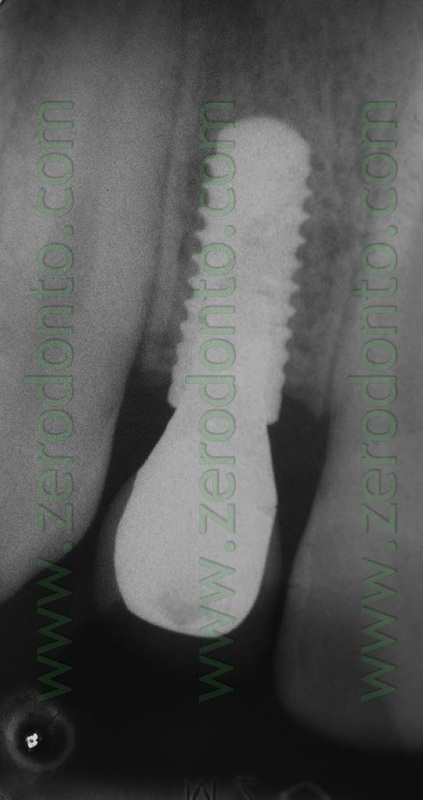 Once the polyether set, a probe was used to clear the access holes to the impression transfer tightening screws, which were unscrewed. 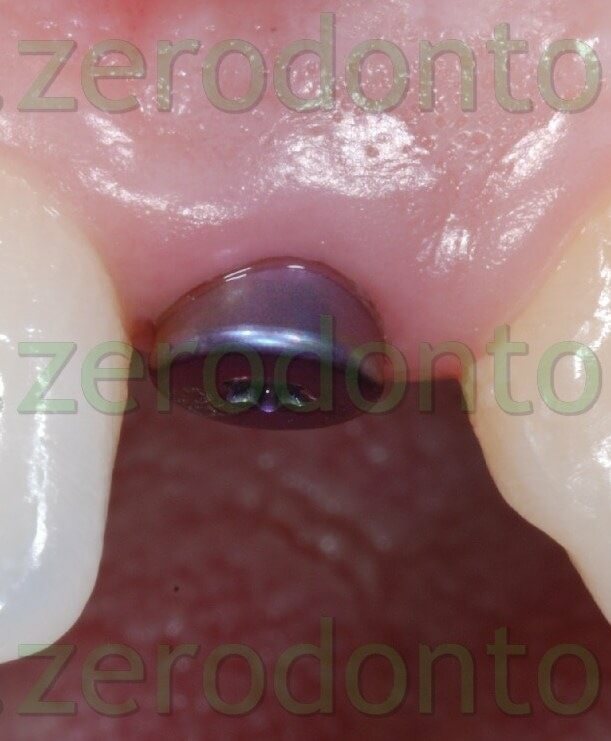 The shades of the elements present on the arch and adjacent to the implant sites were measured in order to make two implant-supported self-polymerizing resin temporary crowns. 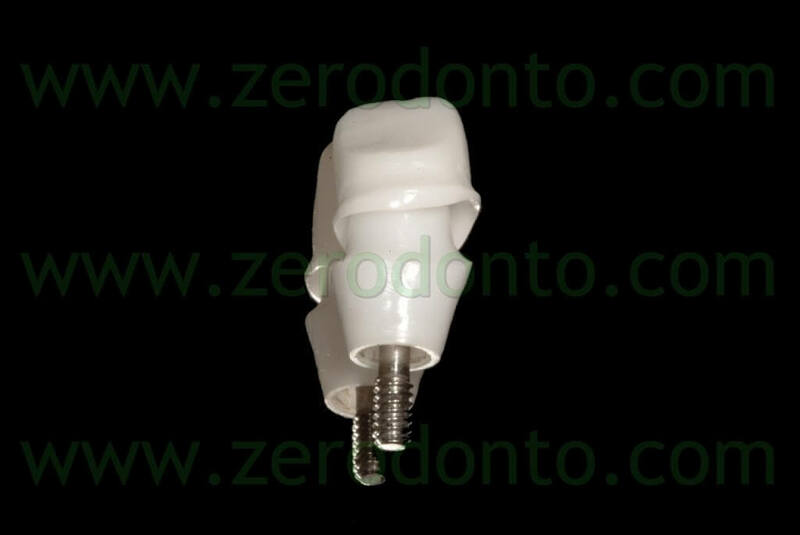 The first temporaries were made on a secondary meso component for Straumann temporary which is screwed directly on the implant. 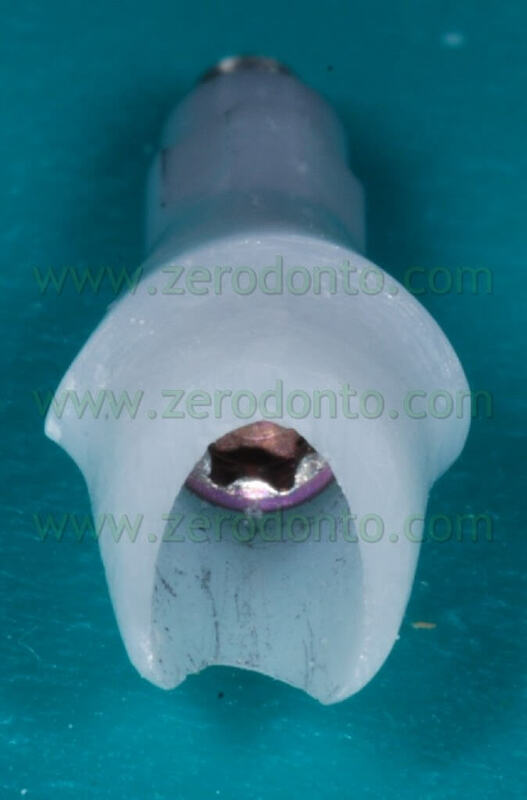 This component for temporary abutment is made up of a titanium part, duplicating the fixture neck and a cylinder-shaped plastic part: this part allows to make both a temporary cemented by means of a preparation of the very component, which is turned into a stump, and a temporary which can be screwed, thus resulting in a temporary with its metallic component incorporated into the resin – leaving room to screw the component. 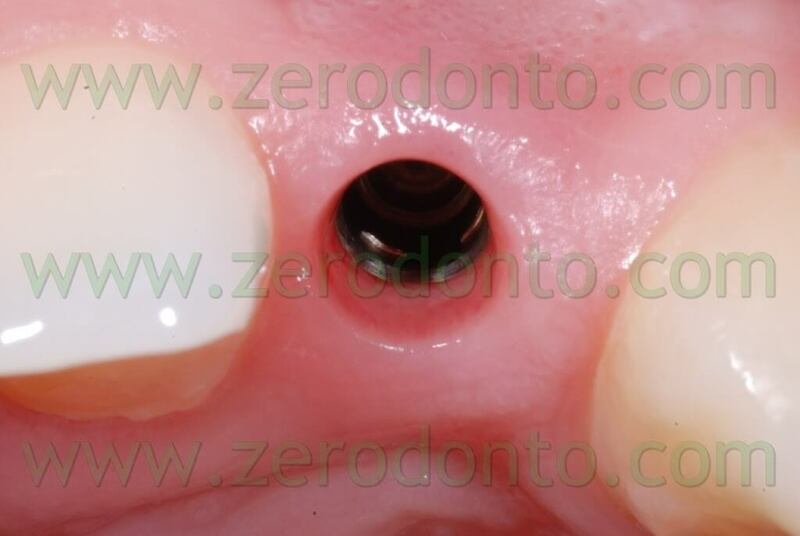 In this case, since the screw would have been in a visible position for access needs, the cemented option was the preferred choice. 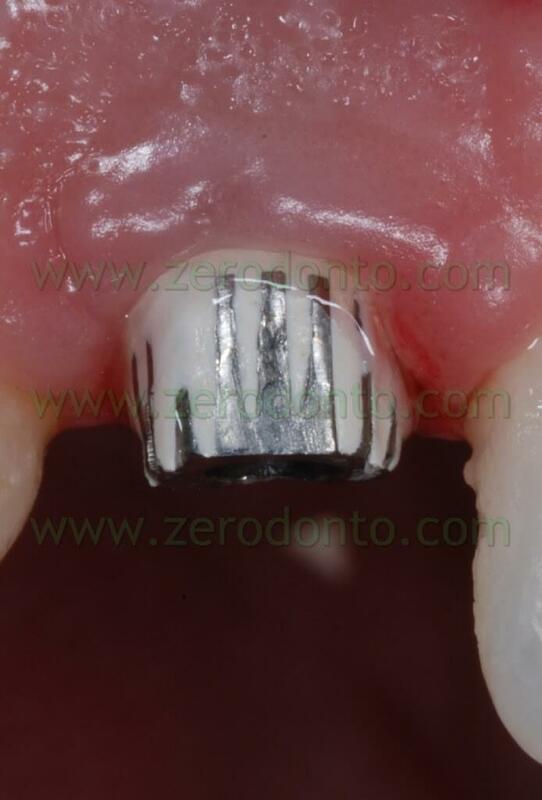 After the preparation of the temporary component, the small dimensions of the stumps needed to make the crowns made part of the metallic retainers visible: two acrylic crowns were made to sort out this issue. 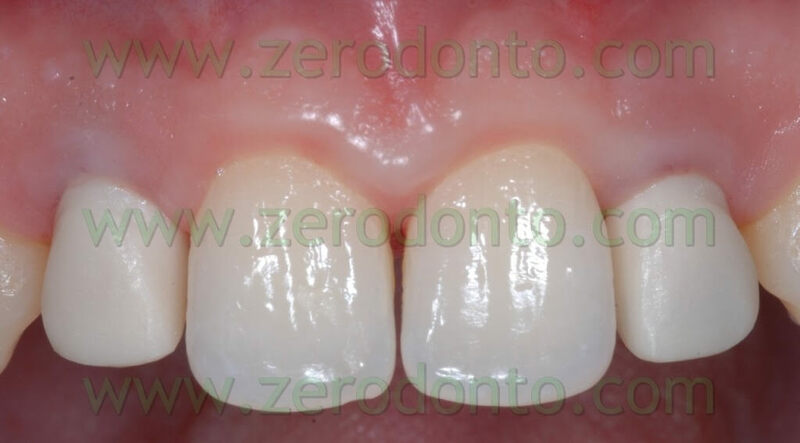 Before performing the temporary cementation, the external surfaces of the temporary crowns were isolated using liquid paraffin, in order to make removal of excess cement easier. 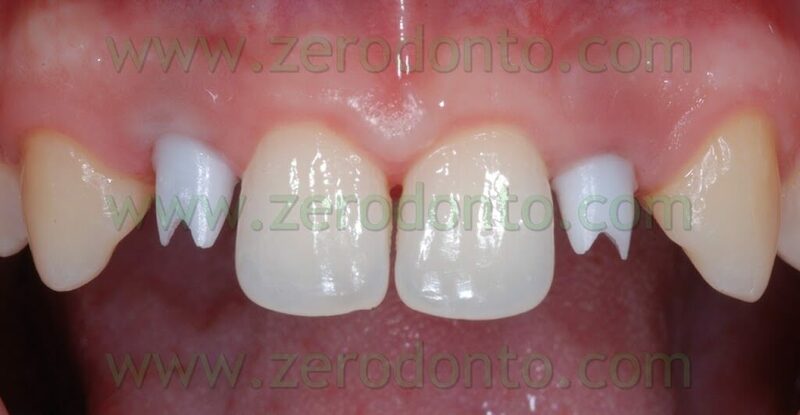 The patient was carefully instructed about the correct procedures of home dental hygiene: the temporary crowns were left in place for 4 months, in order to condition tissues adjacent to the implant, check the accuracy of occlusal functions and allow the finalization of the orthodontic treatment. 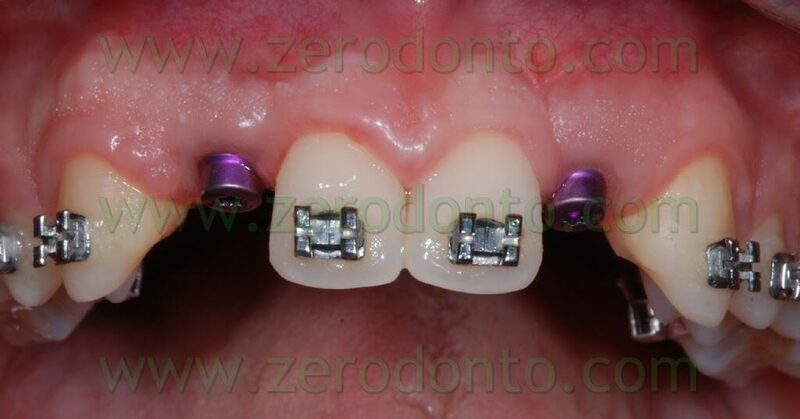 From the orthodontic point of view, the implant-supported temporary crowns were used as anchorage. 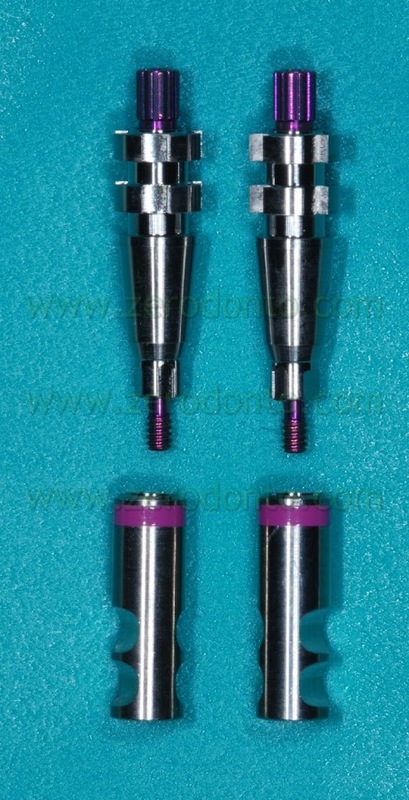 After that period, a second precision impression was taken in order to make the final abutments and crowns. 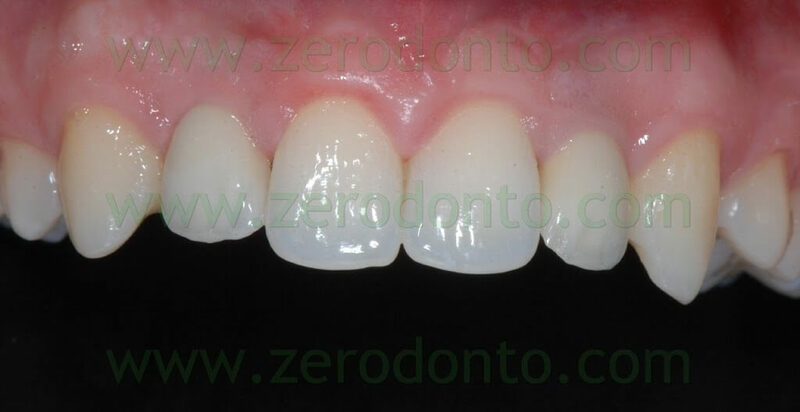 A custom pierced resin impression tray was thus made as previously explained. 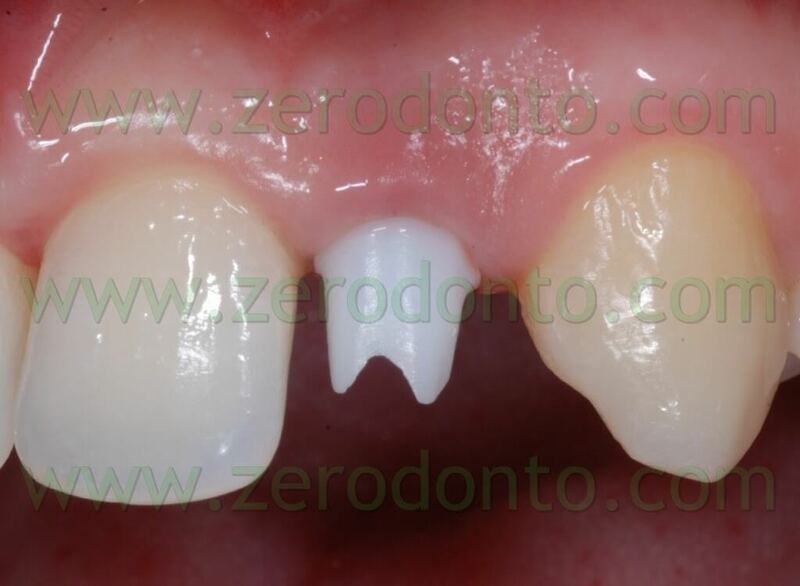 The temporary crowns were decemented and the temporary stumps unscrewed. 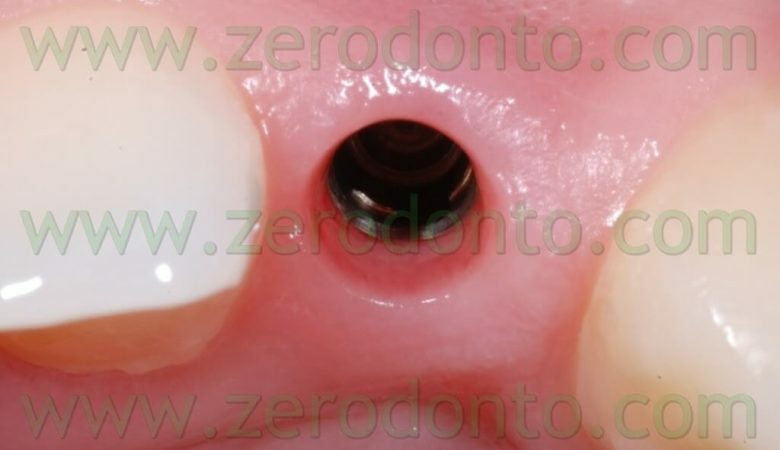 In order to cast the impression and to perform the related verification operations the steps carried out for the first impression were repeated, with the only exception of the consistency of the impression materials: in order to optimize the reading of the emergence profiles a low viscosity polyether was injected intraorally by the impression copings and the adjacent dental elements while a high viscosity polyether was used to fill the impression tray. 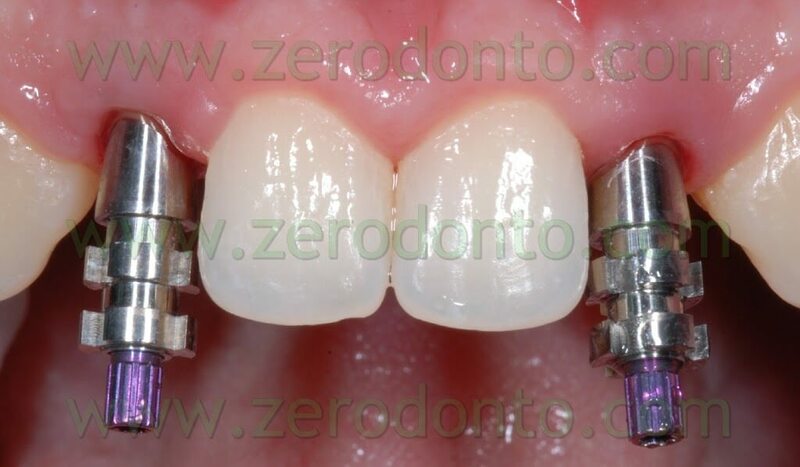 Once the precision of the impression taken was checked, the temporary abutments were screwed again and the temporary crowns were recemented as previously explained. 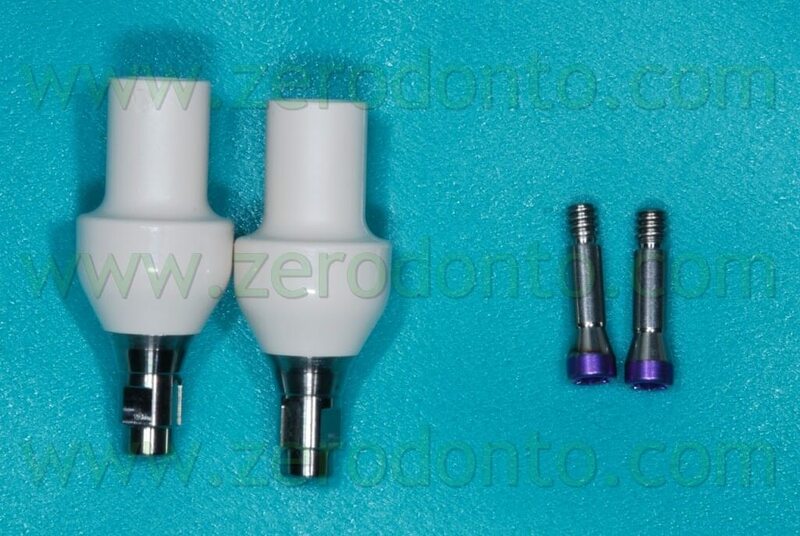 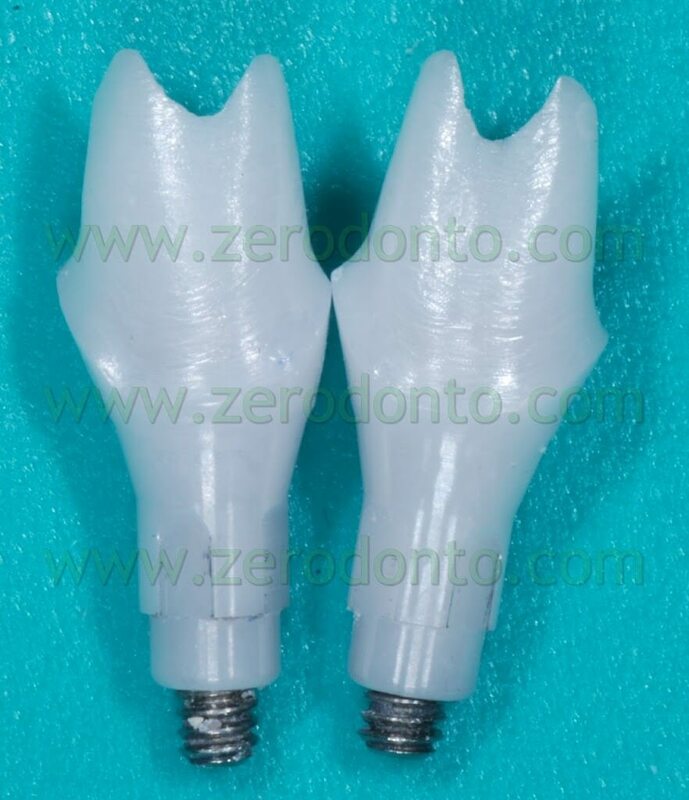 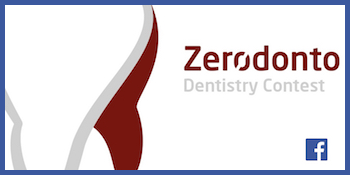 Two Zerion® (zirconium dioxide) stumps customized using Etkon® technology and two zirconia impression copings using CAD-CAM technology (Procera® method) were made. 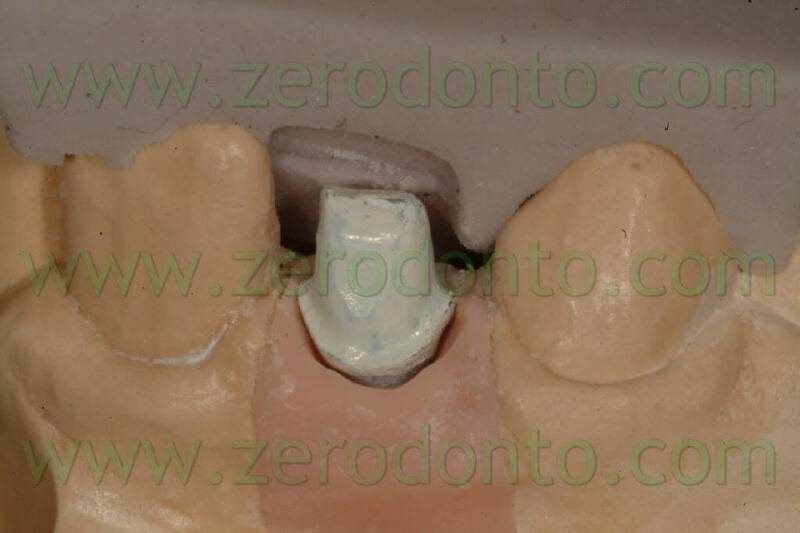 The final impressions were made using 5th class chalk (Fujirok). 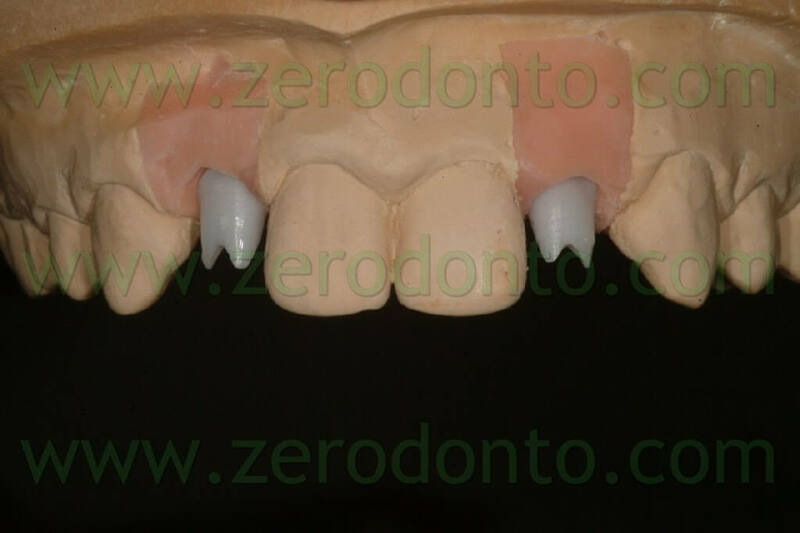 The anatomical zones replicating the gingival portions of elements 12-22 were reproduced using removable silicone to check the correct positioning of the implant components. 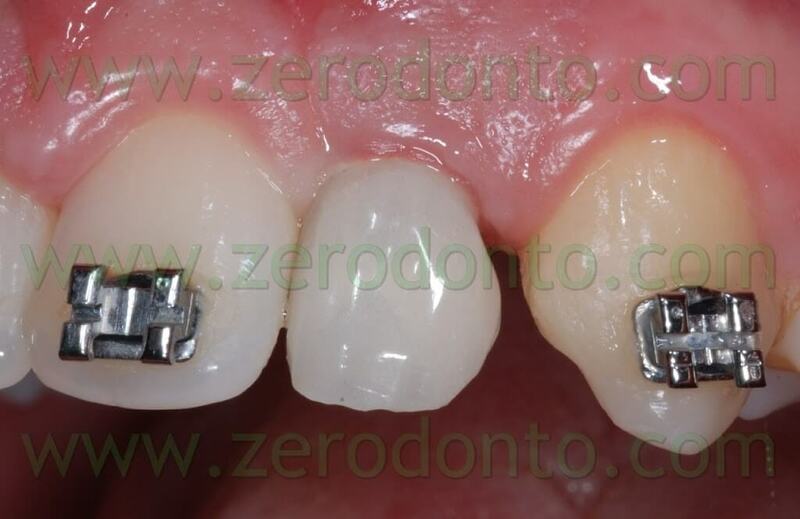 For the abutments the choice fell on zirconia since it allows for a more suitable shade. 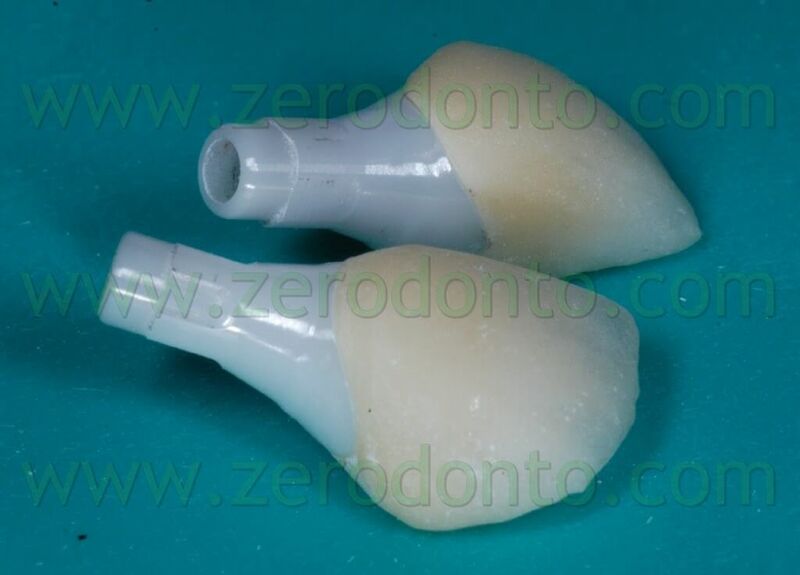 Resin abutments were made from the waxing (resin being necessary for a correct scan), first step for the CAD-CAM procedure. 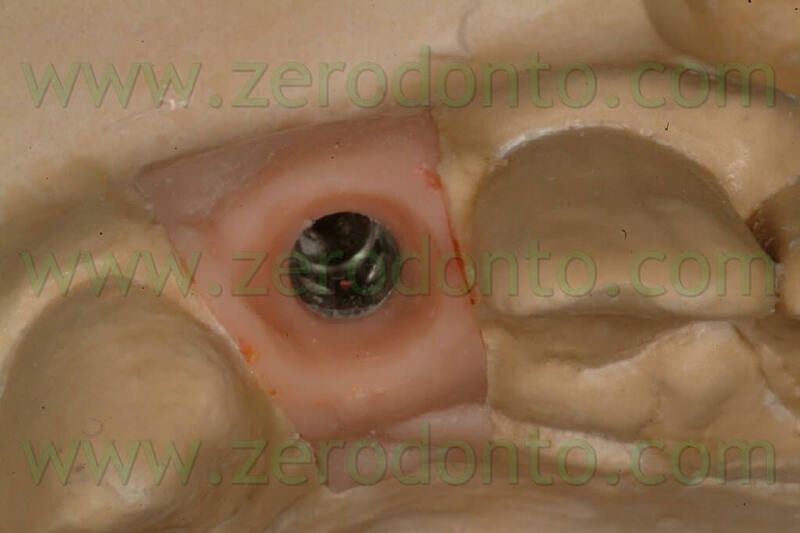 In this case the technique used for the abutments was the Etkon Straumann. 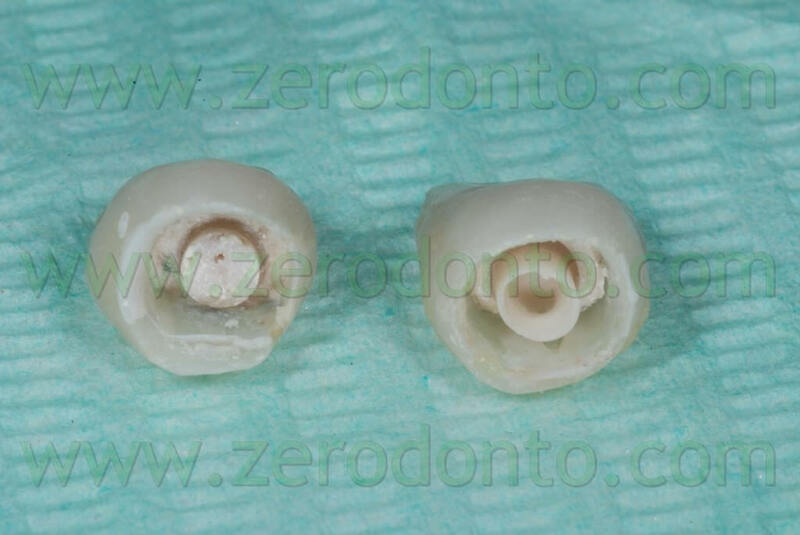 After the industrial manufacturing of the abutments, they were checked in the lab, then rectified. 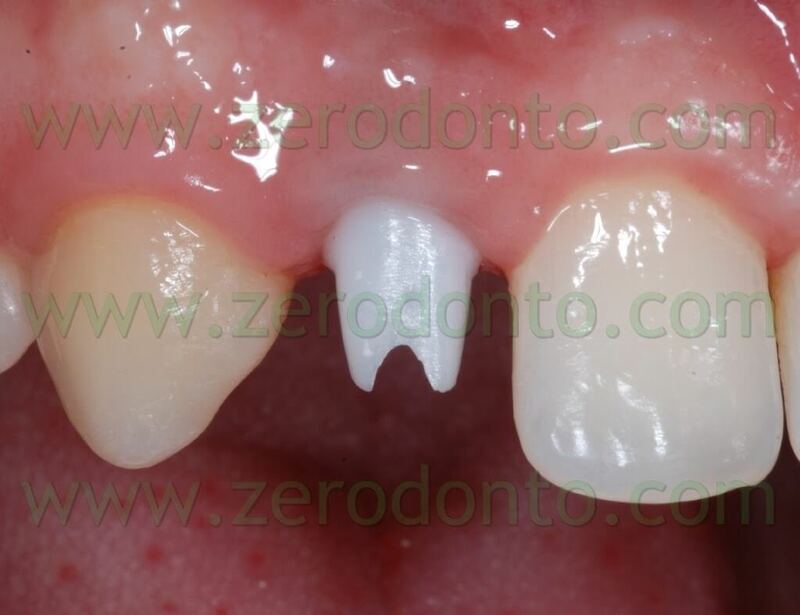 After the decementation of the temporary crowns to test the abutments, a fracture of the coronal part of both the temporary stumps was observed. 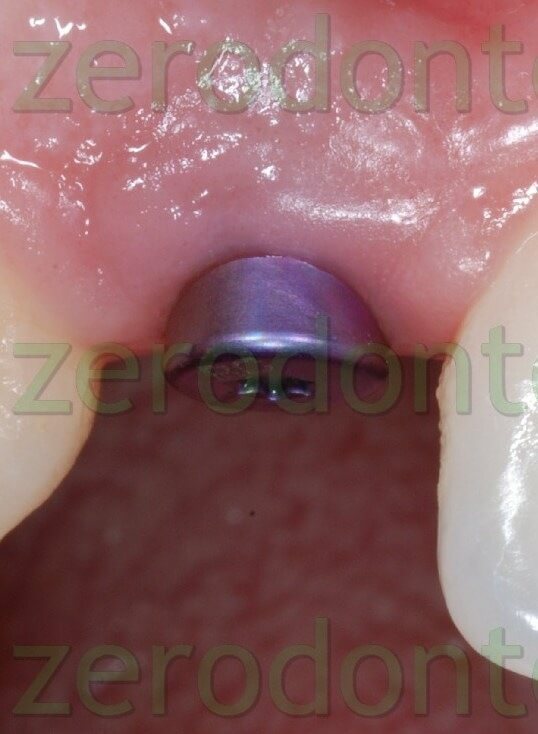 A possible explanation may be that their preparation to support small-sized crowns, like those of the maxillary lateral incisors, had weakened the plastic material surrounding the titanium support too much, thus resulting in a stress fracture. 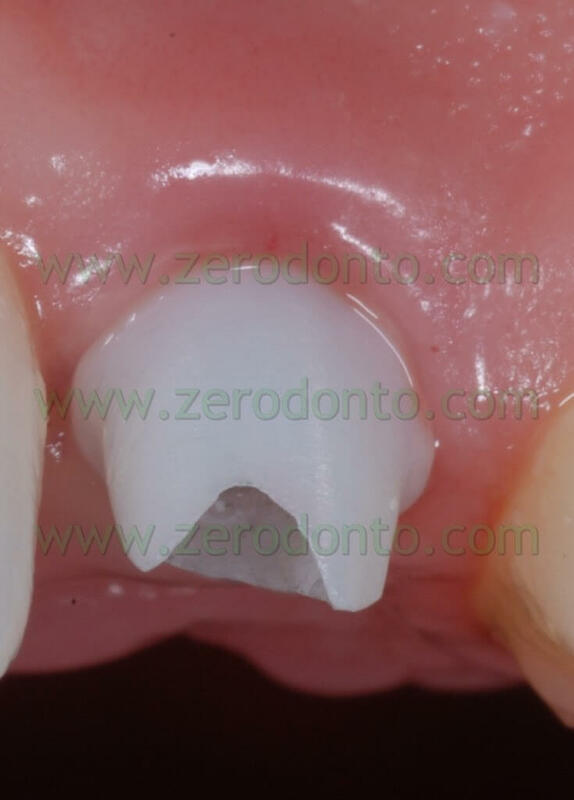 This fracture was not felt at all by the patient. 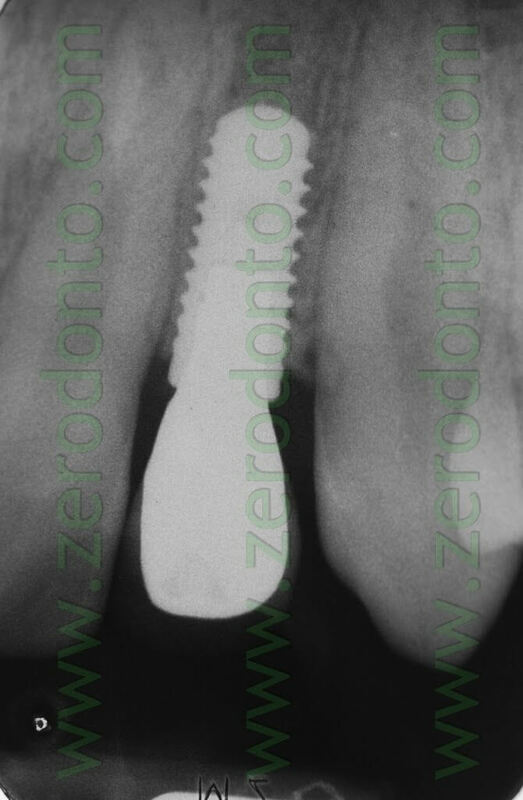 From a clinical point of view, on the other hand, the fracture of the temporary stumps caused the splitting of the subgingival part of the stump: the subsequent marginal infiltration of the crowns determined the onset of an inflammation of the marginal tissues, especially with respect to the buccal surface of the element in position 12. 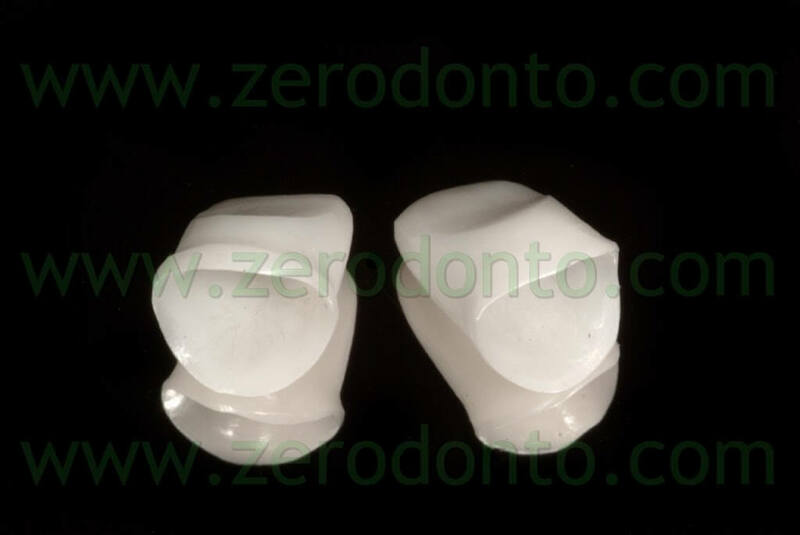 For this reason a second pair of temporaries to be cemented directly on the zirconia abutments was made using New Outline acrylic material. 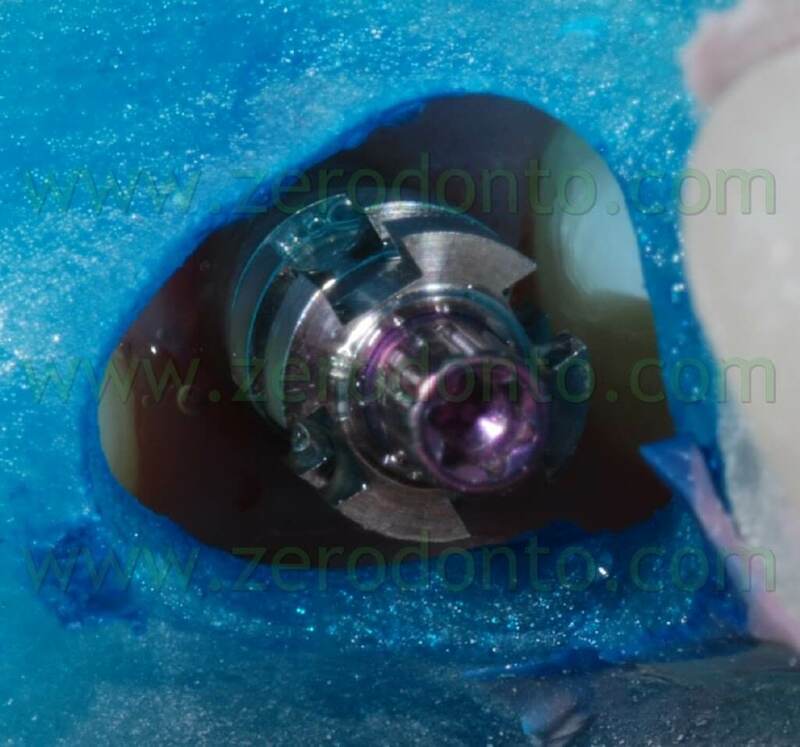 The final abutments were designed so as to position the prosthetic shoulders at 2 mm from the free margin adjacent to the implant: this positioning allowed to check the cementation phase properly. 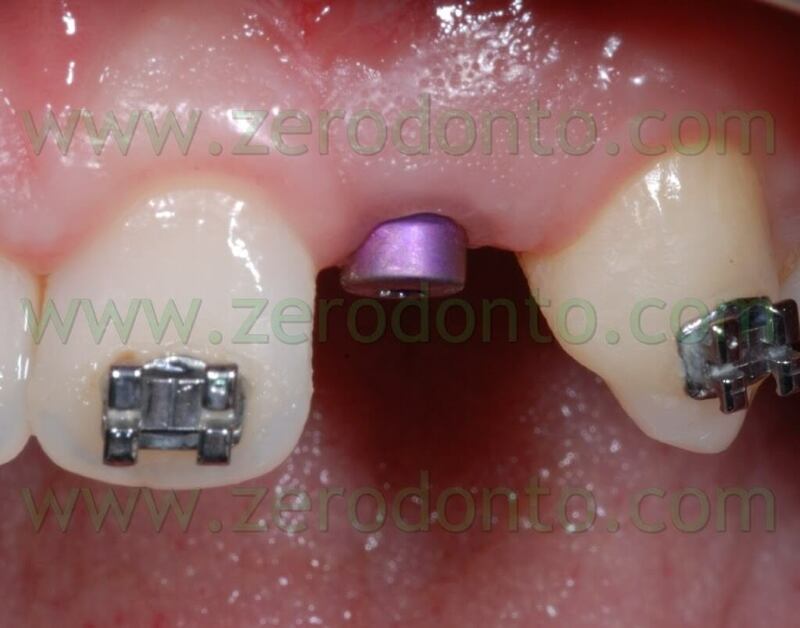 The abutments were subsequently scanned to make small zirconia copings. 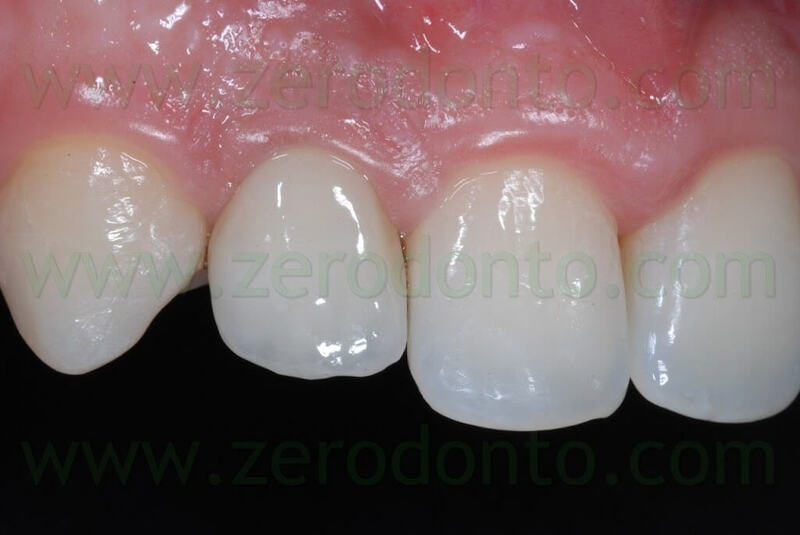 In this case, due to the great aesthetic requirements for the region to be prosthesized, the small zirconia copings were made using the Katana Noritake system: this option was chosen since it is the only system which allows to produce 9 shades not from infiltration of pre-sintered zirconia, but colouring the powders during the compression. 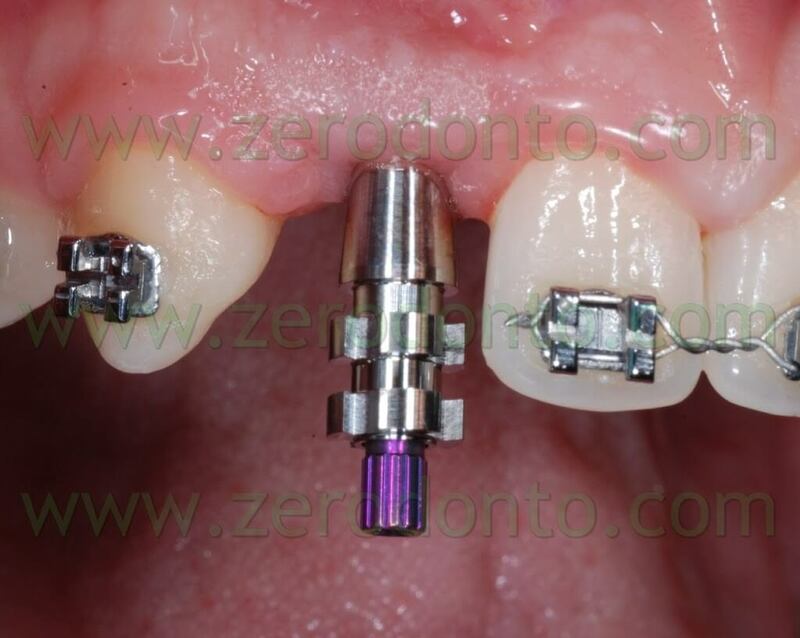 This procedure grants better technological characteristics to the material. 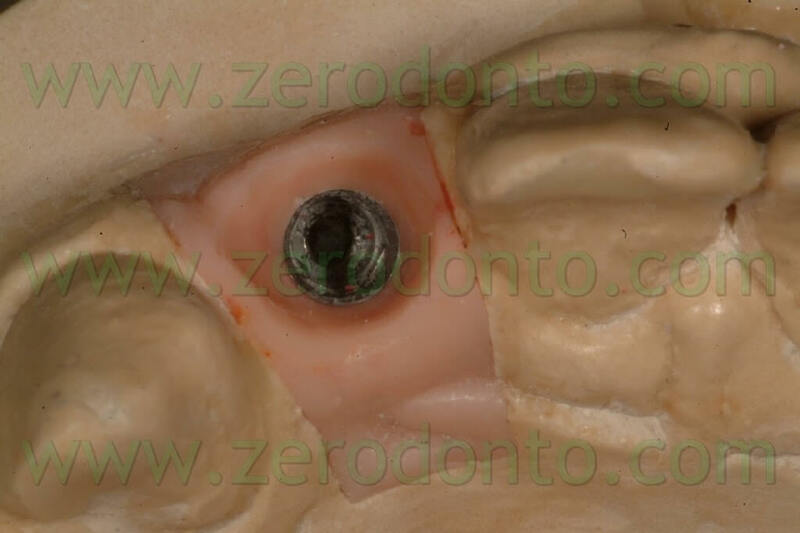 The abutments were screwed intraorally on their implant supports at 35 Ncm using a dynamometric key; the tightening screws were covered with cotton pellets and temporary Fermit cement. 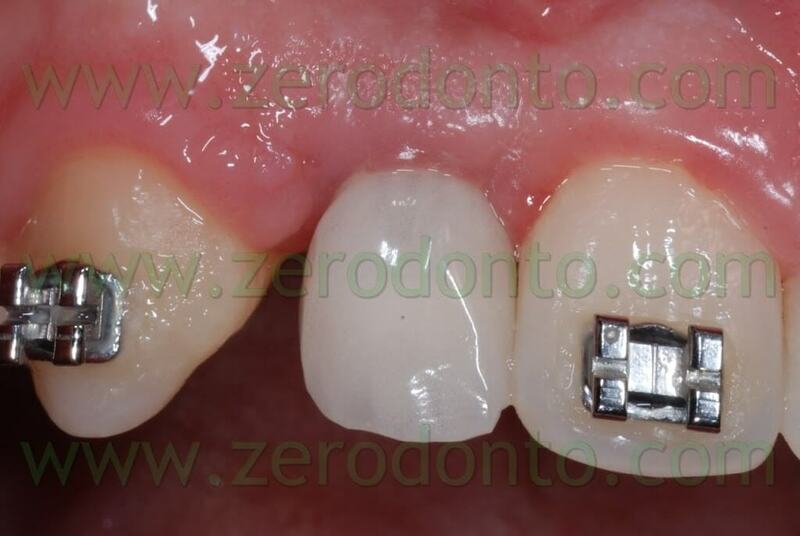 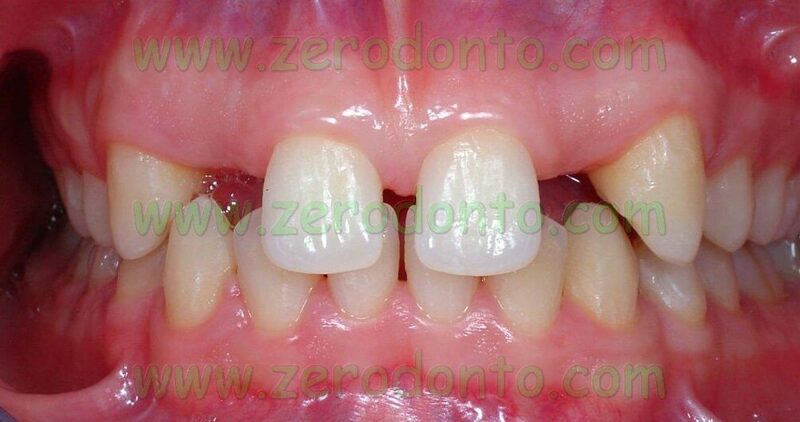 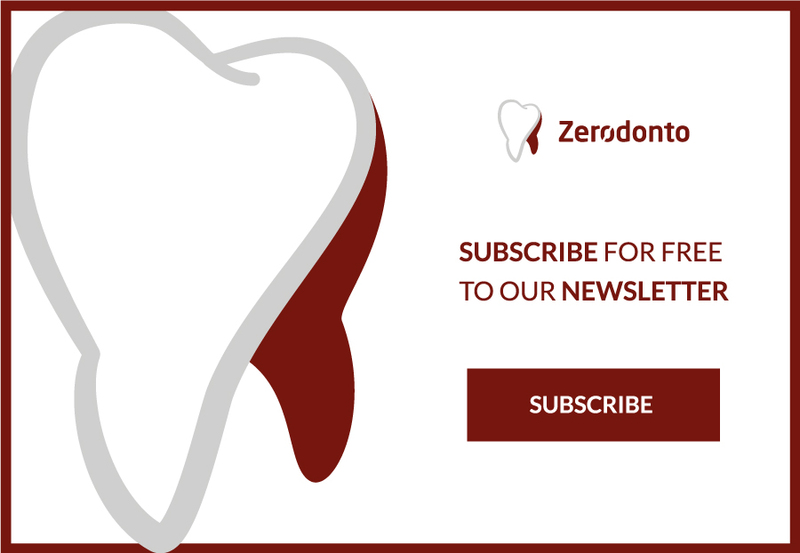 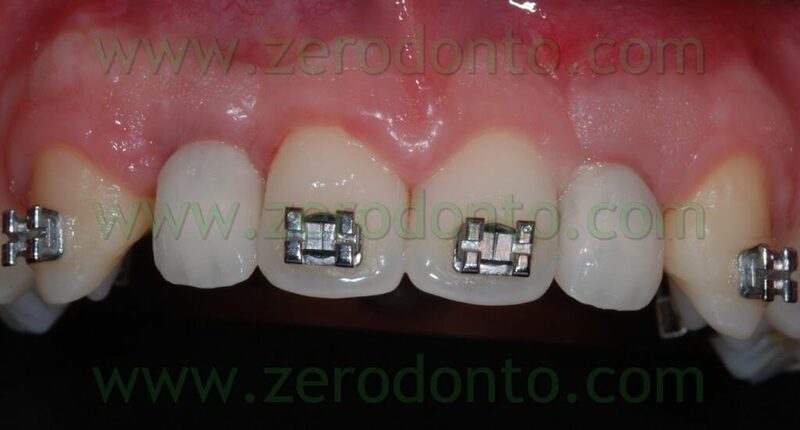 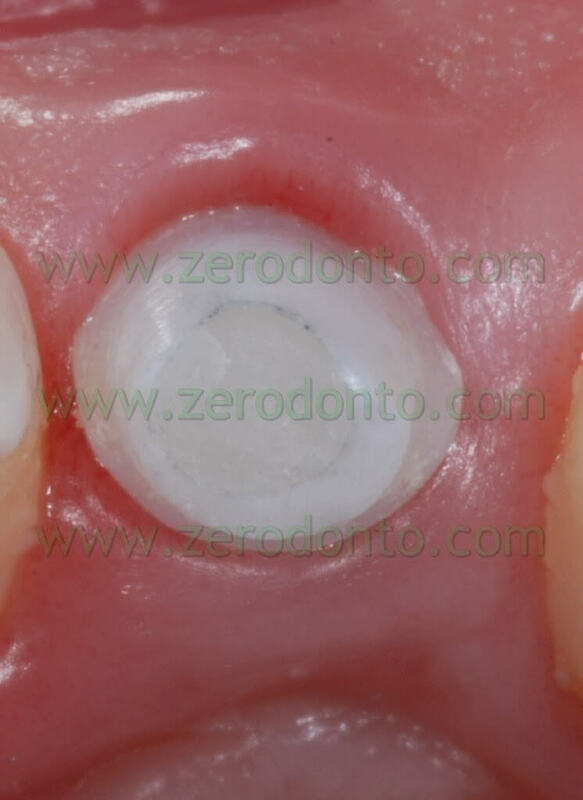 The matching of the zirconia copings was checked intraorally with a Teflon probe under magnification and using X-rays. 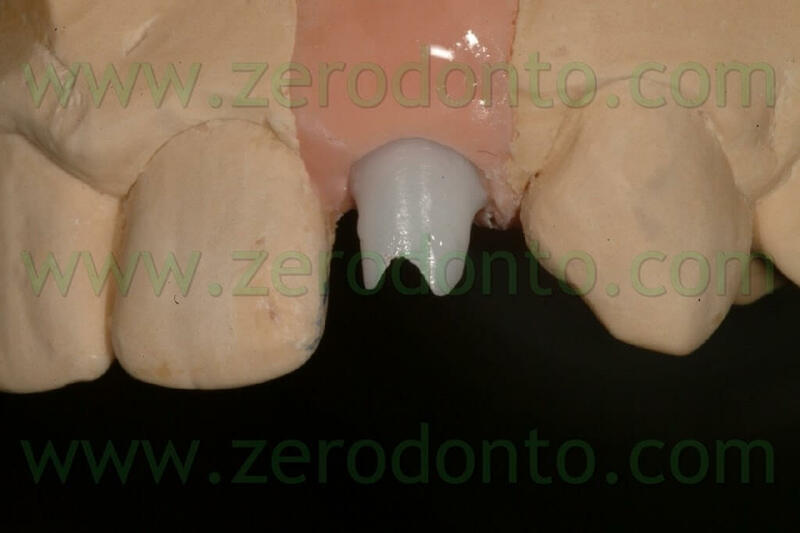 Afterwards, a positioning impression using high viscosity polyether was taken in order to adjust the 3D positioning of the copings and their relationships with the soft tissues. 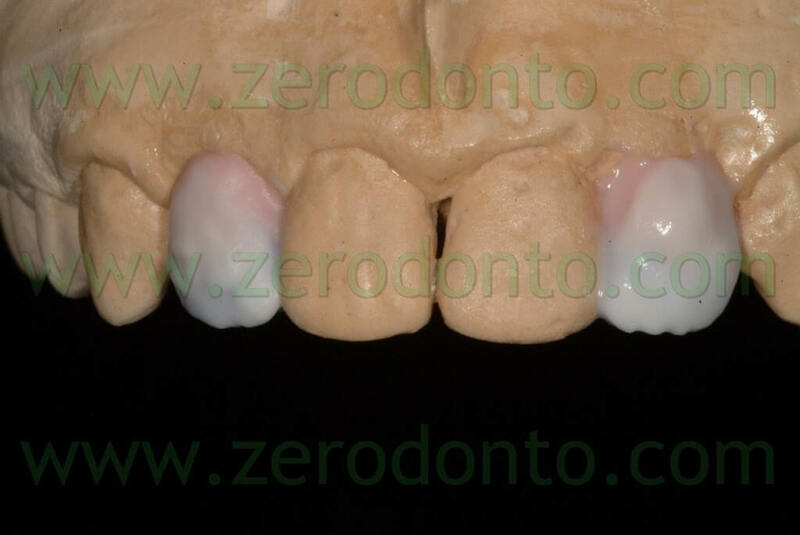 In order to compensate for the relative low-retentiveness of the all porcelain copings, a thin layer of liquid paraffin was inserted inside the structures before adjusting the positioning impression, so as to create a slight biofilm-mediated sucking effect. 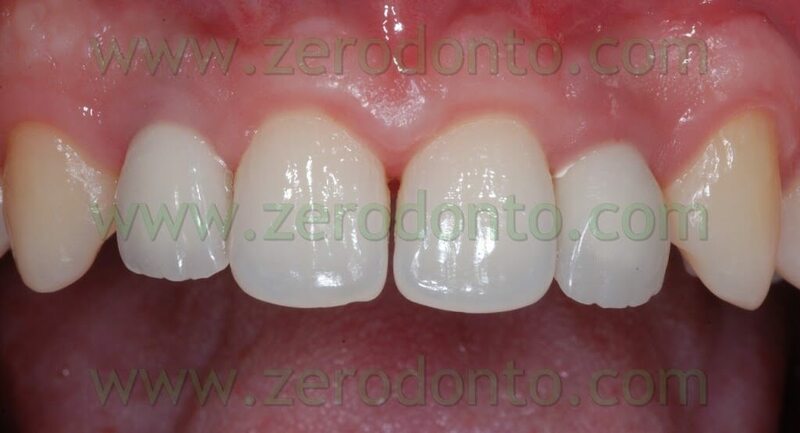 After checking the correctness of the impression, the temporary crowns were provisionally recemented. 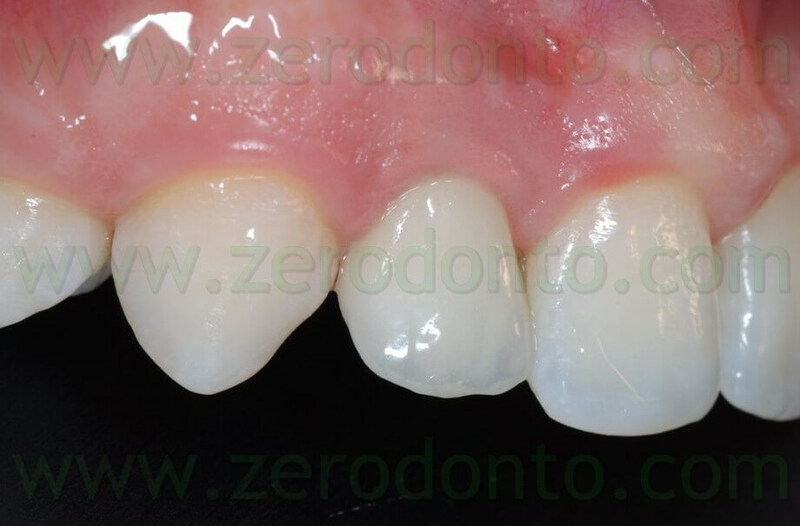 As previously described for the temporarization phase, a measurement of the shades of the elements present in the arch and adjacent to the implant sites was performed in order to make two final implant-supported zirconia-porcelain crowns. 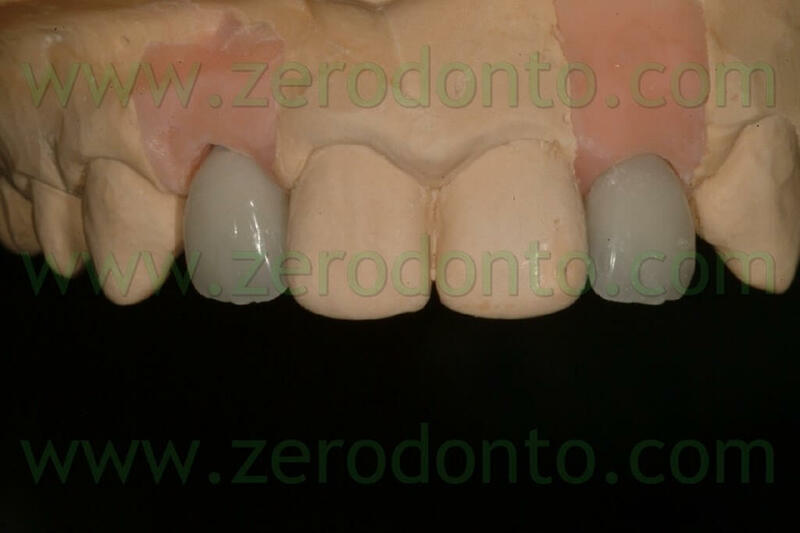 After testing the zirconia copings it was time to move to lab stratification, which was carried out using the simplified stratification technique, applying layers of opaque dentin. 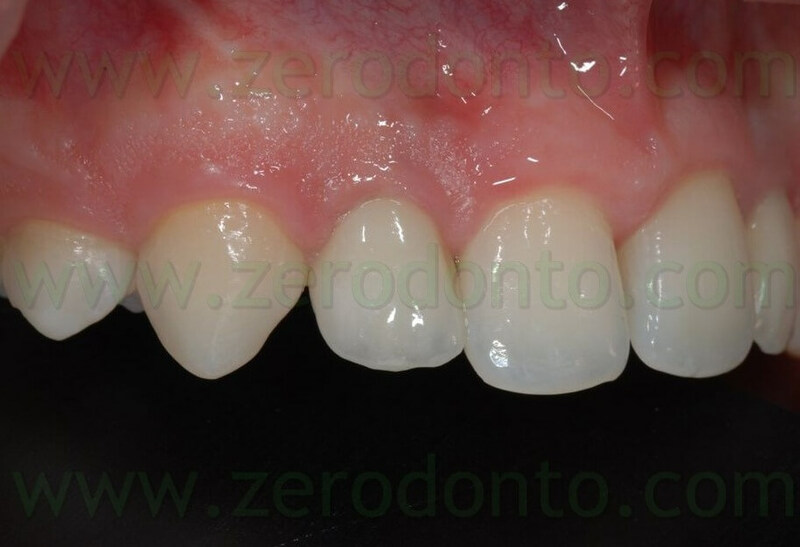 The porcelainization was performed using an aesthetic covering porcelain specific for zirconia. 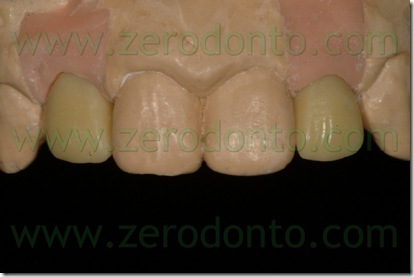 The first step is dentin, then enamel, subsequently it is the turn of incisal effects and finally the cooking. 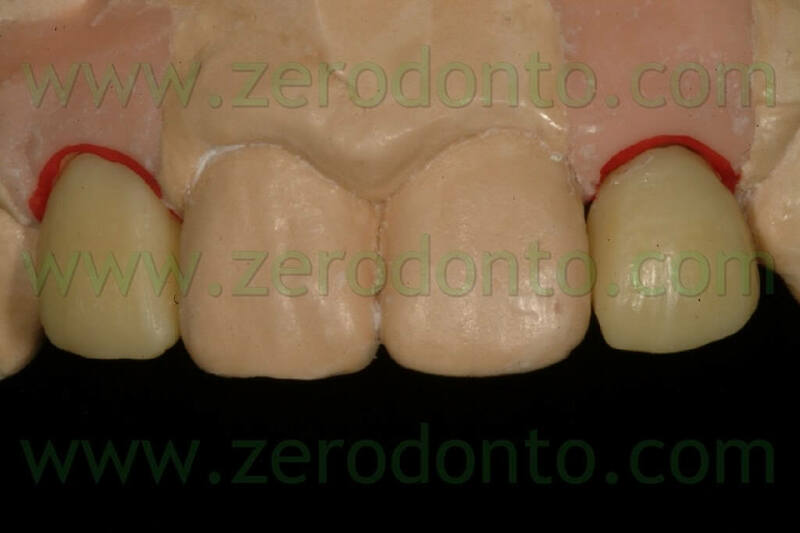 Afterwards the intraoral try-in of unglazed ceramic will point out the possible corrections of morphology and shades, if needed. 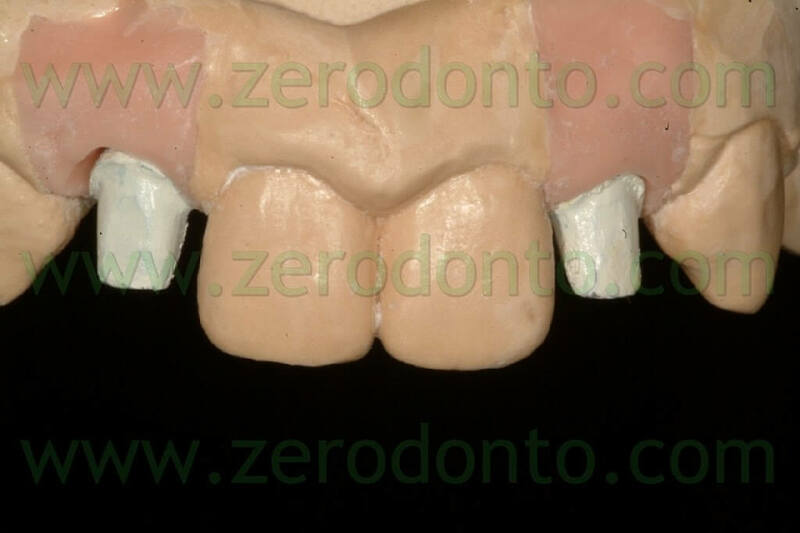 The final step is the mechanical polishing: at this point the final crowns are sent to the dental office. 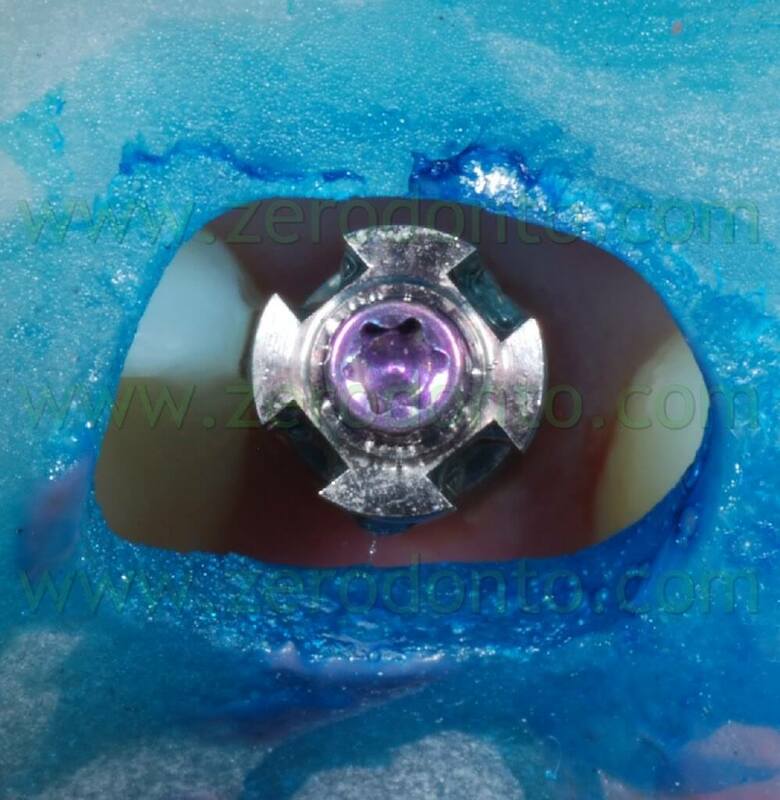 After 5 days, the final crowns were cemented using a dual resin cement (RelyX Unicem Clicker), following the instructions of the manufacturer. 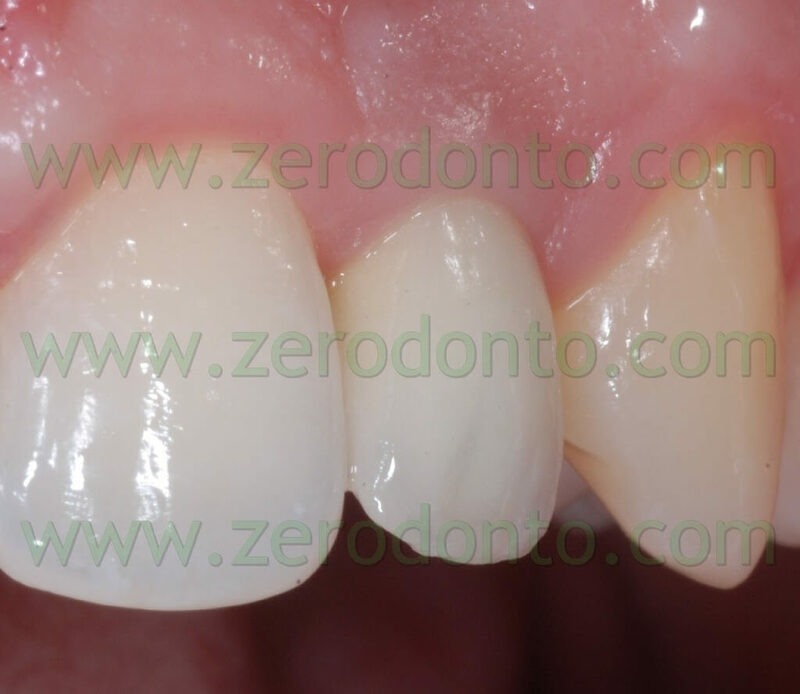 As previously described when dealing with temporary crowns, before carrying out the final cementation, the external surfaces of the all porcelain crowns were isolated using liquid paraffin, in order to avoid the build up of excess cement on the covering porcelain. 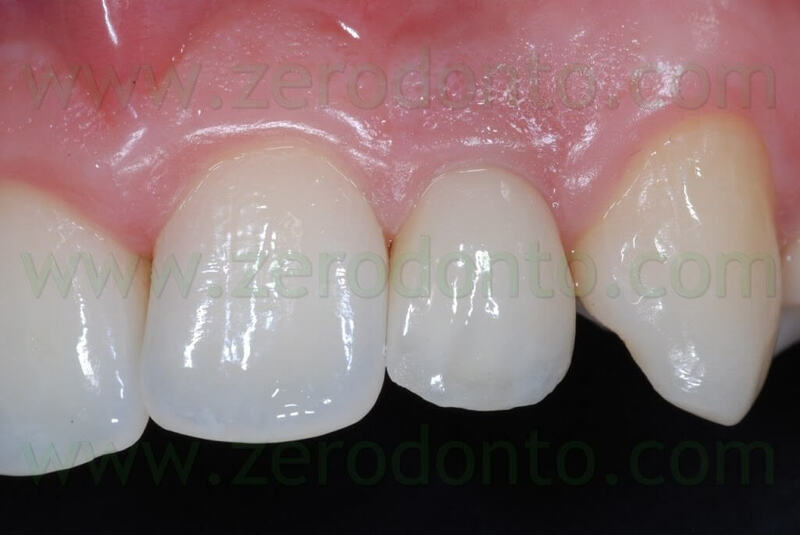 To make the removal of excess cement easier, after seating the crowns, a 2-second polymerization was performed on the buccal and palatal surfaces of the prosthetic restorations, so as to induce a gelification of the resin cement. 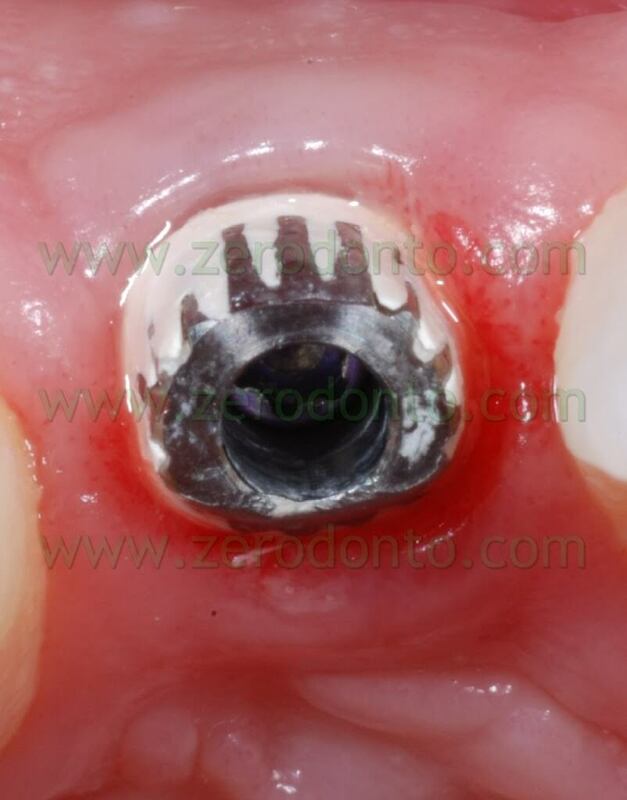 This made it possible to remove excess cement all together using a plastic scaler. 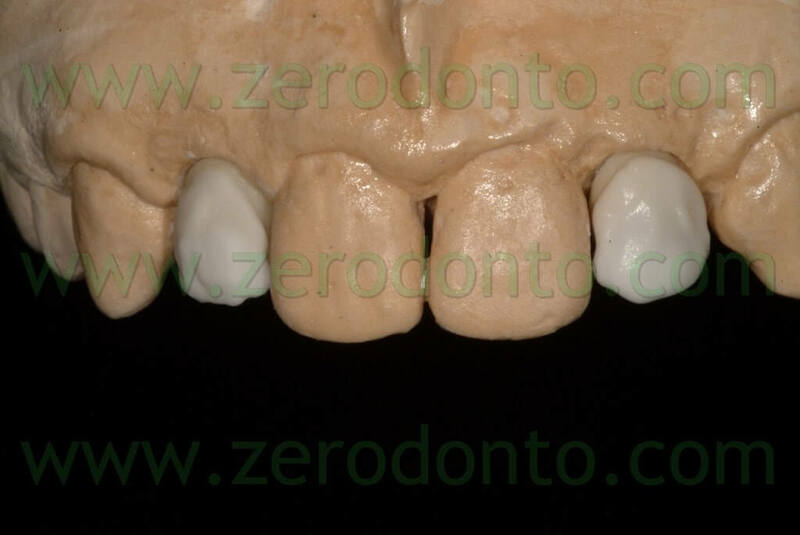 Passing a waxed dental floss through the interproximal spaces allowed to check the absence of remains of cement trapped in those places. 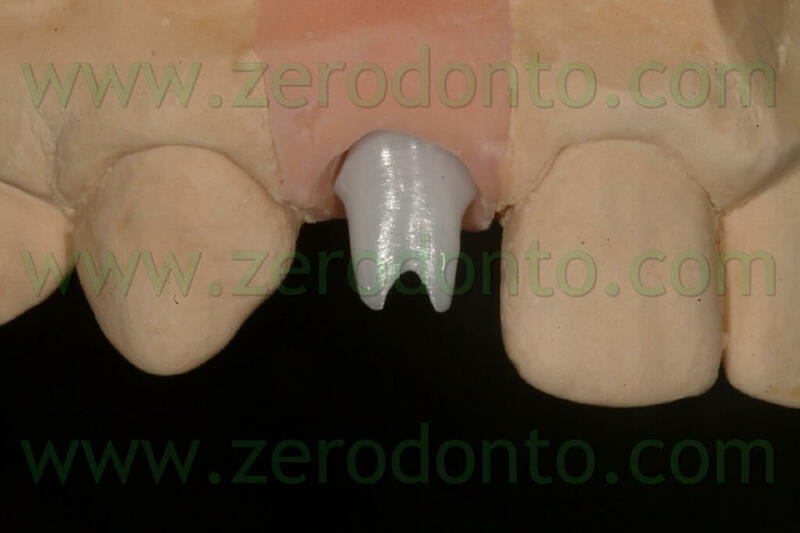 The occlusion was carefully analyzed in centric relation and during eccentric excursions using articulation paper. 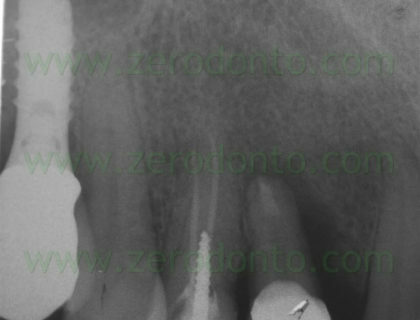 Control X-rays were subsequently done. 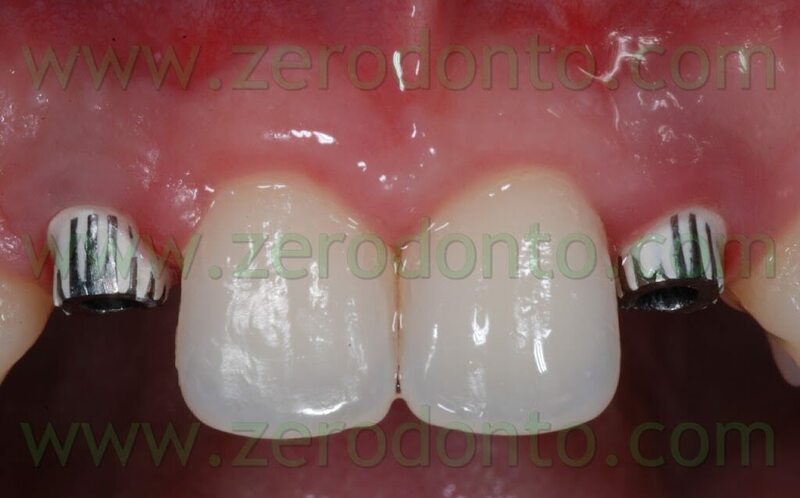 The agenesis of lateral incisors is nowadays a complex therapy that always requires a multi-disciplinary approach and evaluation from an orthodontic, periodontal, prosthetic and implant-related point of view in order to achieve a satisfying aesthetic and functional outcome. 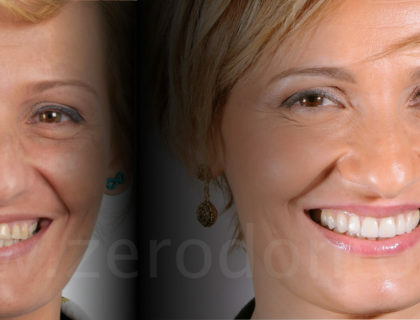 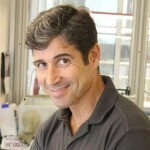 The surgical techniques nowadays allow to treat soft and hard tissues: together with a correct management of the biological space and the temporaries, this makes it possible to achieve an aesthetic and functional result. 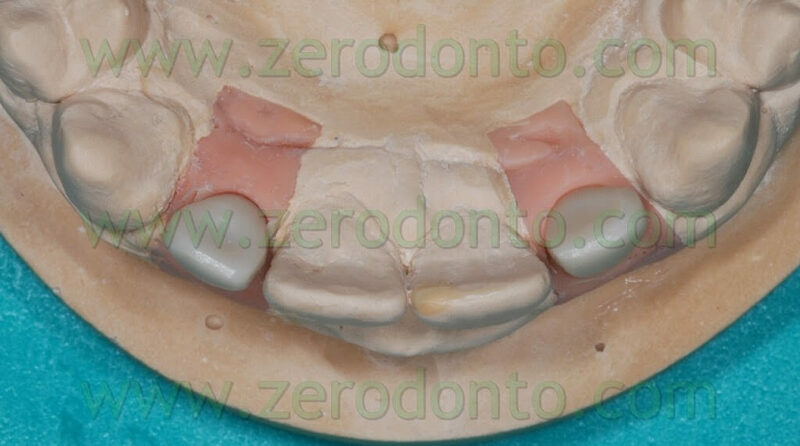 As far as it concerns this specific clinical case, the authors had to face the problem of the fracture of both the temporary stumps (Straumann method): this issue was probably due to the excessive preparation of these items. 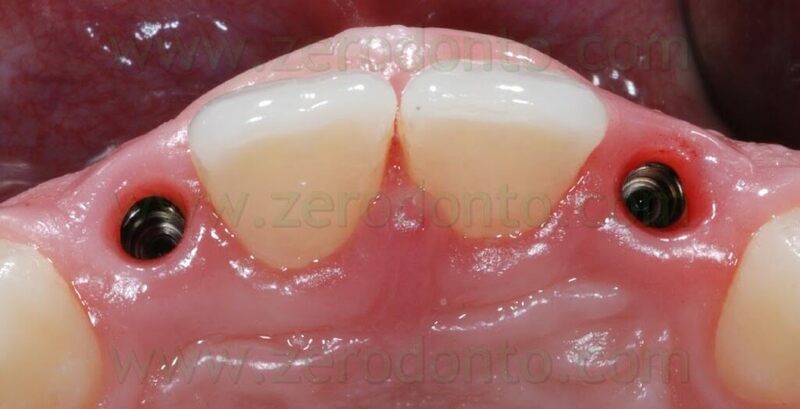 This is the reason why the authors do not find them fit as temporary stumps in very little teeth if they are used with the cemented technique.